The United Kingdom could boost its low, stagnant productivity by raising investment. Employment is high and the UK business environment has many positive aspects, including relatively free and efficient product, labour and capital markets. 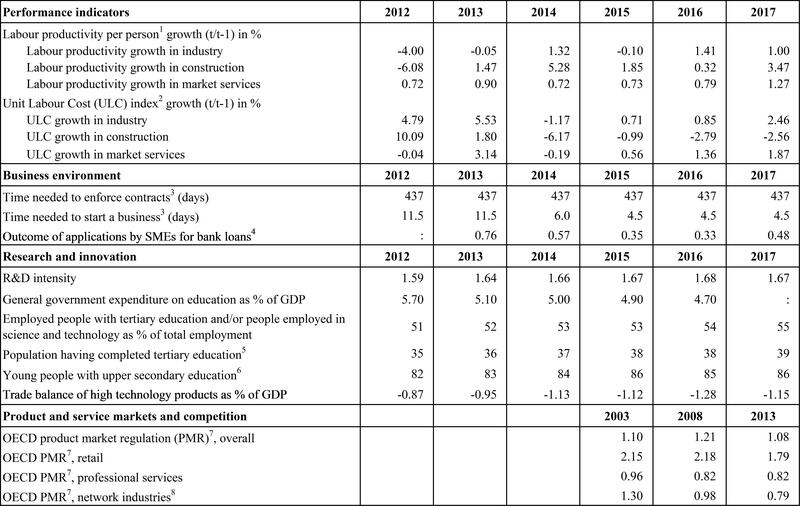 However, labour productivity and investment are low. The UK faces a broad-based need to invest more in equipment, infrastructure and housing, at the same time as bringing down project costs. There are weaknesses in basic and technical skills. Tight regulation of the land market can also prevent capital and labour from moving to where it is most needed ( 1 ). Given the uncertainty over the terms of the UK’s future relations with the EU, this report does not speculate on the possible economic implications of different scenarios. Given the ongoing ratification process of the Withdrawal Agreement in the EU and the UK, projections for 2019 and 2020 are based on a purely technical assumption of status quo in terms of trading relations between the EU27 and the UK. This is for forecasting purposes only and has no bearing on the talks underway in the context of the Article 50 process. The slowdown in the UK’s economic growth is set to continue. Annual growth slowed from a post-crisis peak of 2.9 % in 2014 to 1.8 % in 2017. Growth was relatively subdued through 2018, and 1.4 % for the year. 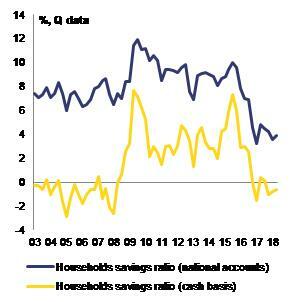 Private consumption was constrained by weak real disposable income and an already-low household saving ratio. Business investment growth also remains weak, due largely to uncertainty related to the UK’s withdrawal from the EU. Net exports contributed negatively to growth as the effect of the depreciation of the pound in 2016 faded and external markets grew more slowly. On the basis of the purely technical assumption, the UK’s GDP growth is expected to remain weak, at 1.3 % in both 2019 and 2020. Consumer price inflation eased gradually, to 2.1 % in December 2018. The steady fall from a peak of 3.1 % in November 2017 largely reflects the fading impact of sterling depreciation. Inflation is expected to be 1.8 % in 2019 and 2.0 % in 2020. The labour market remains resilient, despite slower GDP growth. The employment rate is at a record high (78.6 % in Q3-2018) and unemployment has fallen further, to 4.1 % in Q32018. Wage growth picked up in 2018 but remains relatively subdued given the tight labour market. Growth in average nominal weekly earnings was 3.4 % in November 2018, a 1.1 % increase in real terms. The current account deficit grew in 2018, due to worsening trade and income balances. It was 5.0 % of GDP in Q3-2018, as compared with 3.3 % for 2017. The increase was driven by the trade deficit (1.6 % of GDP in Q3-2018) and the primary income deficit (2.1 % of GDP). Household debt remains high, having stabilised at 86 % of GDP in 2017. Growth in lending to households continued to ease in 2018, in a context of subdued house price growth and housing market activity. The banking system has continued to improve its capital position. UK banks became more profitable in 2017 and 2018. The UK needs to address shortfalls in its investment in both physical capital and people to deliver inclusive, long-term growth. It has long been an outlier among advanced economies for its low investment rate. UK investment also fell particularly sharply in the financial crisis. Shortfalls in both physical and human capital investment contribute to weak productivity. On the physical capital side, the UK needs to deliver a higher level of investment in research and innovation, equipment and house building, and to modernise and expand infrastructure networks while bringing down project costs. On the skills side, the main challenge is to improve the effectiveness of education and training systems in areas such as basic and technical skills, where the UK performs comparatively poorly. Overall, the UK has made some ( 2 ) progress in addressing the 2018 country-specific recommendations. ·Housing investment. Annual net housing supply has increased significantly from postcrisis lows. However, the recovery in house building has lost momentum since mid2017 and it is now flattening off at a level below the estimated growth in demand. Many obstacles to higher house building remain, including extensive ‘no-build’ zones. Real house prices are high, but have stabilised in the context of economic uncertainty. The government has recently extended and revised a number of housing policies, including updating spatial planning rules. It is now easier for local authorities to borrow in order to build public housing, but wholly new initiatives have otherwise been limited. ·Skills and career progression. The government has taken various steps to improve workers’ career prospects. However, the high proportion of low-skilled employees is still weighing on productivity. In parallel with ongoing reforms to work-based training, the government plans to introduce 15 classroombased ‘T-level’ qualifications, but only three of these will be available by 2020. An apprenticeship levy has been introduced to provide funding for employers, but uptake remains low. Overall registrations for the new twin-track system are far fewer than expected. Regarding progress in reaching the national targets under the Europe 2020 strategy, the UK is performing well on greenhouse gas emissions. It has made progress on renewable energy and energy efficiency but additional effort is required if it is to achieve the 2020 targets. The UK performs relatively well on a number of indicators of the Social Scoreboard supporting the European Pillar of Social Rights, but some challenges remain. A high percentage of people are in work or training, jobs are being created, and youth and longterm unemployment is low, but there is persistent underemployment, with pay and career progression remaining difficult for some. Although social transfers are relatively efficient in reducing poverty, employment creation is not enough to reduce in-work poverty. Child poverty has also risen in the last four to five years and is predicted to rise further. ·High general government debt is a potential source of vulnerability. The fiscal deficit was 2 % of GDP in 2017-2018, down from 2.4 % in 2016-2017. General government debt has started to fall, to 85.7 % of GDP in 2017-2018, but it is projected to remain above 80 % in 2020-2021. In the long term, a projected increase in spending on public pensions, health and care in the UK poses risks to fiscal sustainability. ·The availability and affordability of housing remains a major challenge. House prices and rents remain high, especially in areas of high demand, and there are signs of overvaluation. Significantly fewer young adults now own their own homes and this contributes to inequality between generations. The amount and location of land available for new housing is limited by tight regulation of the land market, particularly around big towns and cities. This has prevented housing supply from responding adequately to shifts in demand, and inflated the price of building land and existing houses. The government recognises the problem and is implementing a range of measures to boost housing supply, but house building remains below what is required to meet estimated demand. ·It is easy for most people to find work, but some find it hard to progress. Employment is high, but challenges persist in the form of significant underemployment, low-quality jobs, poor contractual conditions, and disadvantages for women and people with disabilities. The increase in zerohour contracts and other forms of potentially precarious work is a cause for concern. The extent to which the Good Work Plan (issued in December 2018) will address this remains to be seen. Career progression remains difficult for many, with people turning to second jobs and extra hours to make ends meet. There are significant skills shortages, while many workers are lowskilled. Various initiatives are being taken to improve the quality of work and workers’ chances of career progression, including through the Industrial Strategy and in-work upskilling measures. ·There are significant poverty-related challenges. The proportion of people with disabilities who are at risk of poverty or social exclusion is higher than the EU average. 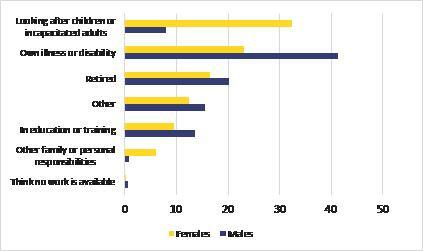 The gap in employment rates between those with and without disabilities is much wider than the EU average. This is partly because many of the former leave the school system early. The Disability Employment Strategy and the ‘Improving Lives: the future of work, health and disability’ strategy are designed to tackle these issues. Child poverty is high and it is projected to rise. Rates of in-work poverty are also up, particularly for parents. On the other hand, the proportion of pensioners in poverty has halved over the last two decades, from one in three to one in six. Homelessness, in particular among children, has increased considerably and is predicted to rise further. ·Productivity was already relatively low and it has stagnated in the past decade. Labour productivity is significantly lower in the UK than in other developed economies. Output per hour has barely risen since before the financial crisis and new jobs have been mainly in lowproductivity sectors. This appears to be linked to deep-rooted policy issues. The UK has long stood out among advanced economies for its low rate of investment. There is scope to raise productivity by addressing broad-based problems such as low investment in equipment, infrastructure and R&D, and gaps in (especially basic and technical) skills. ·Major investment is needed to modernise and expand infrastructure networks. Use of the UK’s road, rail and aviation networks is reaching capacity and the country needs to deliver new and greener energy generation capacity. UK infrastructure development has tended to be costly and slow. After decades of public under-investment, the government is starting to deal with the infrastructure deficit. In July 2018, the National Infrastructure Commission published a wideranging longterm assessment of infrastructure needs to 2050. It is likely to be particularly hard to secure all the outside funding required in the government’s projections, and to do so cost effectively. The pace of economic growth in the UK has continued to slow from its peak in 2014. It slowed from its post crisis peak of 2.9 % in 2014 to 1.8 % in 2017 and 1.4 % in 2018 (Graph 1.1). Private consumption continued to grow modestly in 2018, averaging 0.4 % quarter-on-quarter, marginally above the 2017 average rate. Despite an easing in inflation and a modest increase in nominal wage growth in 2018, the squeeze on real disposable incomes continued to constrain private consumption growth. Through 2018 nominal wage growth accelerated moderately above the rate of consumer price inflation (Graph 1.2), resulting in positive real wage growth. The household saving ratio is at near historic lows, limiting the scope for further private consumption growth (Graph 1.3). The cash-basis saving ratio ( 3 ) was negative in the third quarter of 2018 and close to zero for the preceding four quarters, indicating that households have been spending almost all of their gross disposable income. Surveys suggest that savings intentions of consumers are high, reflecting weak overall consumer confidence. 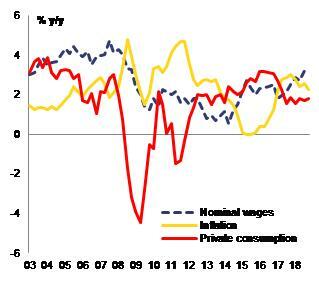 It is therefore assumed that private consumption growth will remain weak in 2019 and 2020 as households take the opportunity of rising real wage growth to maintain savings. Business investment growth also remains weak, largely due to uncertainty surrounding the UK’s withdrawal from the EU. Business investment fell for four consecutive quarters to 2018-Q4, by a total of 3.7 %, the first such persistent fall since 2009. As a result, total business investment was 0.9 % lower in 2018 than 2017. Various business surveys indicate that this subdued performance is largely due to ongoing uncertainty over the UK’s future trading relationship with the EU. Business investment growth is projected to rebound slightly in 2019 but to remain relatively subdued following a prolonged period of heightened uncertainty. The contribution of net exports to GDP growth deteriorated significantly in 2018. Net trade made a negative contribution (-0.2 pps) in 2018. Moderating external demand, sector-specific issues resulting in lower car exports, and heightened uncertainty over the UK’s future trading relations with the EU27 led to a large decrease in goods export growth. 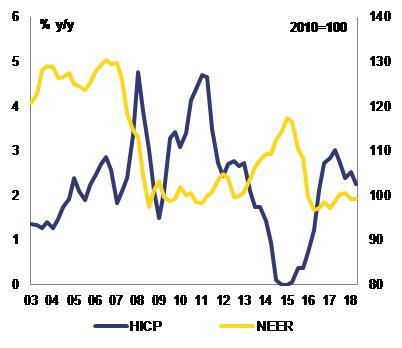 Over the forecast period, the net trade contribution to growth is projected to remain weak, in line with softer external demand. UK GDP growth is expected to remain subdued in 2019 and 2020. Given the ongoing ratification process of the Withdrawal Agreement in the EU and the UK, projections for 2019 and 2020 are based on a purely technical assumption of status quo in terms of trading relations between the EU27 and the UK. This is for forecasting purposes only and has no bearing on the talks underway in the context of the Article 50 process. On that basis, GDP growth is expected to remain weak at 1.3 % in both 2019 and 2020. Weak productivity growth continues to weigh on potential GDP growth. Potential GDP growth has remained relatively subdued compared to the pre-crisis period (Graph 1.4). This is in line with the stagnation of labour productivity since the economic crisis discussed in Section 3.4. While the contribution from total factor productivity (TFP) increased slightly from 2014 to 2017, a large part of the modest increase in potential GDP since the crisis has been due to growth in the labour force and employment. Consumer price inflation has eased gradually from its peak of 3.1 % in November 2017 to 2.1 % in December 2018 (Graph 1.5). This easing largely reflects the fact that the inflationary impact of the 2016 depreciation of sterling has mostly faded. As the impact of sterling’s depreciation on consumer prices unwinds fully, inflation is expected to ease to 1.8 % in 2019 and recover slightly to 2.0 % in 2020. Despite the slowdown in GDP growth, headline labour market figures remain positive. The robust labour market performance in recent years has supported potential growth (see above). The labour market continued to tighten in 2018, with job creation across most sectors and unemployment falling further, to 4.1 % in Q32018. Wage growth remains relatively subdued. Regional disparities on key employment indicators are relatively narrow, except in youth inactivity, which ranges from 26.7 % in Cumbria to 59.6 % in Inner London-West. 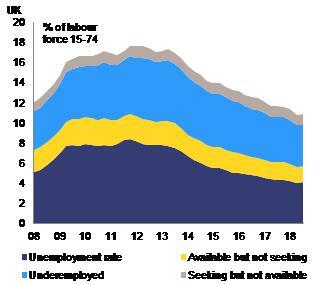 However, low unemployment seems to mask remaining labour market reserves. The rate of underemployment continues to be relatively high (4.1 % in Q32018), above pre-crisis levels (Graph 1.6). The recovery in average hours worked has remained sluggish (European Commission, 2018a), suggesting that the labour market recovery is not yet complete. Recent research (Bell and Blanchflower, 2018) has found that the natural rate of unemployment has fallen sharply, so much lower unemployment may now be needed to reach full employment. EU net migration into the UK continues to decline. According to the Office for National Statistics (ONS), in the year ending June 2018, EU net migration was at its lowest level since 2012 (74 000), down from 189 000 in the year ending June 2016. This was mainly driven by the fall in the last two years of the number of long-term EU migrants arriving in the UK (219 000 in the year ending June 2018, a decrease of 23 %). The number of EU citizens leaving the UK (145 000 in the year ending June 2018) has remained stable following an increase between the years ending September 2015 and September 2017. At the same time, the ONS reported record vacancy numbers of 845 000 in August to October 2018, up 44 000 on the same period a year earlier. Wage growth remains relatively subdued. Nominal compensation per employee grew by 3.1 % in 2017, only slightly above inflation (2.7 %). Average growth in weekly earnings rose to 3.4 % in November 2018 (a 1.1 % increase in real terms), and it is expected to remain at similar levels in 2019 and 2020. During the crisis and the subsequent recovery, wage growth has often been lower than what would be predicted on the basis of economic fundamentals ( 4 ). According to recent research (European Commission, 2018a), the UK is among the Member States with a higher cumulated wage gap in 2010-2017, although this gap was wider in 2010-2013 than in 2014-2017. This is consistent with the idea that some labour market slack remains despite low headline unemployment (see above). Social indicators have improved, and income inequality is now close to the EU average. The proportion of people at risk of poverty or social exclusion (AROPE) (22 % in 2017) has been declining since 2012 and is just below the EU average (22.4 %). However, the proportion of people living in low work-intensity households remains quite high (10.1 % in 2017, vs 9.5 % in the EU). Income inequality before social transfers is relatively high. However, the tax and benefit system significantly reduces inequality in disposable income. In 2017, the income of the richest 20 % was 5.4 times that of the poorest 20 %, which is above the EU average (5.1) ( 5 ). Homelessness is increasing and shows no signs of abating. According to recent research by the housing and homeless charity Shelter, there were around 320 000 homeless people in the UK in Q12018. This is a 4 % increase on the same period a year earlier (Shelter, 2018). The increase was largely driven by rises in homeless people in temporary accommodation and people without a shelter of any kind. Worryingly, homelessness is also surging among children. A calculated 131 000 children were homeless in March 2018. This is 3 % higher than last year and 59 % higher than five years ago. Wales and Scotland have seen bigger proportionate increases in homelessness than England over the last year (ibid.). The improvement in the current account in 2017 reversed in 2018. The current deficit rose to 5.2 % of GDP in 2016, the largest deficit on record (Graph 1.7), before narrowing to 3.3 % of GDP in 2017. The majority of this improvement came from the primary income balance becoming less negative. 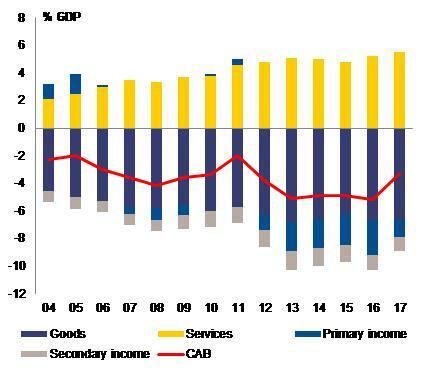 Despite the boost to cost competitiveness from the depreciation of sterling in 2016, the improvement in the trade balance, particularly in services, contributed much less. Despite the improvement in 2017, the current account balance still poses external financing risks. At around 3 % of GDP in cyclically-adjusted terms, the current account deficit remained considerably below the country-specific ‘norm’ of around zero suggested by fundamentals. The current account deficit subsequently increased throughout 2018, reaching 5.0 % of GDP in Q32018. This increase resulted from a worsening of the trade deficit, to 1.6 % of GDP, and the primary income deficit, to 2.1 % of GDP. The financing of the current account deficit has become more risky alongside a reduction in the appetite of foreign investors for UK assets. In 2017 and early 2018, the share of foreign inflows in the ‘other investment’ category into the UK increased. This category includes loans and deposits to banks. As highlighted by the Bank of England’s Financial Policy Committee (FPC) in November 2018, other investments are short-term in nature and are therefore subject to foreign investors’ appetite and refinancing risk. In recent quarters this position has reversed with net outflows of other investments by foreign residents. Over the same period, the net outflow of other UK investments has not been offset by net positive inflows of portfolio investment and positive but diminishing net inflows of foreign direct investment. Consequently, there has been a net outflow of total overseas investment into the UK over this period. Foreign investors’ appetite for UK assets appears to have reduced over the latter part of 2018, which is consistent with heightened uncertainty over the terms of the UK’s future relations with the EU. At the same time, UK residents have reduced their net acquisition of foreign assets faster than the rate at which overseas investors’ disinvested of UK-based assets. The UK’s growing current account deficit was therefore largely financed by the sales of UK overseas assets, rather than the inflow of overseas investment over recent quarters. The net international investment position deteriorated slightly in 2017. It widened from 2.4 % of GDP in 2016 to -8.1 % in 2017. This was the result of total assets decreasing by GBP 112 billion (EUR 127 billion), while liabilities increased by GBP 6 billion (EUR 7 billion) and remained larger than assets. In 2017, the sterling exchange rate appreciated which led to a lower valuation in the stocks held abroad when converted back into sterling. In February 2019, the Bank of England maintained Bank Rate at 0.75 %. The Bank’s Monetary Policy Committee also voted in its February meeting to maintain the stock of sterling non-financial investment-grade corporate bond purchases, financed by the issuance of central bank reserves, at GBP 10 billion (EUR 11.3 billion). The Committee also voted unanimously to maintain the stock of UK government bond purchases, financed by the issuance of central bank reserves, at GBP 435 billion (EUR 492 billion). The Committee judged that, were the UK economy to continue to develop broadly in line with their February 2019 projections, an ongoing tightening of monetary policy over the forecast period would be appropriate to return inflation sustainably to their 2 % target. The Committee reiterated that any future increases in Bank Rate are likely to be gradual and limited. The UK banking system has continued to improve its capital position and the profitability of UK banks improved in 2017 and 2018 (see Section 3.2.1.). Consequently, the banking system is in a better position than before the global financial crisis, though challenges and risks persist. In particular, costs relating to past misconduct are still likely to affect profitability in the coming years. UK investment banking revenues also remain subdued. In November, the Bank of England’s Financial Policy Committee (FPC) maintained the UK countercyclical capital buffer rate at 1 %. The FPC continued to judge that, apart from those risks related to Brexit, domestic financial stability risks remained at a standard level overall. The FPC also judged that the Bank’s 2018 stress test showed that the UK banking system was resilient to deep simultaneous UK and global recessions that were more severe overall than the global financial crisis. The 2018 European Banking Authority stress test produced unexpectedly weak results for UK banks, which partly reflects differences in methodology and the scenarios applied (see Section 3.2.1). The pace of growth in unsecured lending to households continued to ease in 2018. Total lending to households grew by 3.8 % year-on-year in December 2018, slightly below its post-crisis peak of 4.3 % in March 2016. Lending secured on dwellings grew by 3.3 % (Graph 1.8), close to the 2017 average rate (3.1 %). Unsecured consumer credit growth continued to slow to 6.6 % year-on-year, down from its post crisis peak of 10.9 % in November 2016. The Bank of England’s 2018 stress test showed that UK banks could successfully absorb potential losses on mortgage lending and consumer credit in a severe stress scenario. Despite stabilising over recent years, household debt remains high. After falling steadily from a peak of 96 % of GDP in 2009, household debt has broadly stabilised in the past four years. In 2017, household debt stood at 86 % of GDP, stable from 2016. In its November 2018 Financial Stability Report, the FPC stated that the proportion of households with high mortgage debt-servicing ratios is close to historical lows. Nonetheless, the Commission’s prudential threshold and fundamentals-based benchmarks for household debt suggest that household indebtedness still poses financial stability risks. Furthermore, the Commission’s household debt sustainability indicators (S1 and S2) suggest that the near record-low household saving ratio would need to increase to make debt levels sustainable over both the medium and long term. Growth in credit for non-financial corporates was 2.6 % year-on-year as of December 2018. This growth was driven by credit to large businesses, which grew by 4.0 % annually. At the same time, growth in credit to small and medium-sized enterprises grew by only 0.1 % year-on-year, which limited the increase in corporate leverage. The ratio of gross non-performing loans improved and was one of the lowest in the EU at 1.3 % as of Q22018. After several years of falls, which continued into 2018-2019, the budget deficit is set to level off. The deficit stood at 2 % of GDP in 2017-2018, down from 2.4 % of GDP in 2016-2017. In the Commission’s 2018 autumn forecast it was projected to continue the downward trend, from 1.3 % of GDP in 2018-2019 to 1.2 % of GDP in the two following financial years. With the output gap remaining small, the structural budget deficit was expected to follow a similar pattern. However, the Commission forecast did not reflect the expansionary measures announced in the 2018 Autumn Budget (HM Treasury, 2018). Using fiscal space created by an underlying improvement in the public finances, the Chancellor announced a significant discretionary loosening of fiscal policy in the 2018 Autumn Budget. Due to higher than expected tax revenues and lower spending, the Office for Budget Responsibility (OBR) revised down its borrowing forecast for 2018-2019 by GBP 11.9 billion (EUR 13.5 billion, 0.5 % of GDP). From 2019-2020, the underlying improvement to the fiscal position, which the OBR judges to be permanent (on a no-policy-change basis), will mostly be offset by extra spending. For 2019-2020, the Chancellor announced additional spending of GBP 10.9 billion (EUR 12.3 billion). Of this, around 50 % is for the National Health Service (NHS), and this is set to increase further in the following years (see Section 3.1). The OBR projects that the Government will meet its fiscal targets (see Section 3.1) (OBR 2018a). General government debt remains high, but has started to fall. Government debt fell from a peak of 86.4 % of GDP in 2016-2017 to 85.7 % of GDP in 2017-2018. According to the Commission’s 2018 autumn forecast, this downward trend should continue over the forecast period, to 85 % of GDP in 2018-2019 and 82 % of GDP in 2020-2021. For the 2018 Autumn Budget, the OBR revised its debt forecast down and now expects debt to fall slightly faster than previously expected. Since the start of the European Semester in 2011, the UK has recorded at least ‘some progress’ on 94 % of CSRs addressed to it. This includes 15 %, covering access to finance and fiscal policy, where it achieved ‘substantial’ progress. 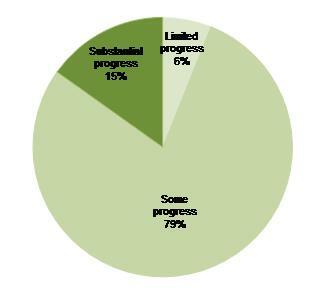 On the other 6 % of CSRs, it has recorded only ‘limited’ progress (see Graph 2.1). On labour market, housing and infrastructure CSRs, it has tended to record ‘some’ progress. While the government has put in place a range of relevant policies, these are all deeprooted and longstanding policy challenges still requiring sustained reform efforts. There has been more variation in the assessment of fiscal CSRs over time as the pace of ongoing fiscal consolidation has fluctuated, as have trends in public investment. (1) The overall assessment of the CSRs related to fiscal policy exclude compliance with the Stability and Growth Pact. (3) The multiannual CSR assessment looks at the implementation since the CSRs were first adopted until the February 2019 Country Report. The fiscal deficit has gradually decreased to well below 3 % of GDP. The UK left the Excessive Deficit Procedure of the Stability and Growth Pact in 2017. The UK has announced a range of policy measures to increase housing supply. Residential construction and net additions to the housing stock have risen since the start of the decade, due both to an ongoing cyclical recovery from a post-crisis trough and to policy action, including major reforms to the planning system. Housing has become less affordable, despite a recent slowdown in house price rises. The high cost of housing, which is particularly acute in major urban centres, underlines the long-term and structural challenges in the housing market. The government recognises these challenges and has set itself the ambitious goal of increasing annual housing supply in England to 300 000 units by the mid-2020s. Household debt remains high but household balance sheets are strong on aggregate, while households and the broader economy appear resilient to short-term shocks. The UK has received recommendations on a range of labour market and social issues. On skills and apprenticeships, concerns persist as regards the implications of low workforce skills for career progression and productivity. Skills mismatches and shortages have increased as employment rates have hit historical highs. However, career progression is difficult for many and upskilling of those in work merits sustained policy efforts and investment. An extensive review on Modern Work Practices in 2017 has resulted in a reform of the vocational training system due to be completed by 2020, the development of ‘T-level’ qualifications, and the establishment of a tripartite National Retraining Partnership comprising the government, employers and trade unions. On childcare, gradual reforms are yielding good results. Publicly funded provision has expanded over the last decade, though issues with the adequacy and affordability of childcare remain. The UK also received recommendations from 2011 to 2014 on poverty and the welfare system. These had a particular focus on child poverty, which remains quite high and is predicted to increase due to cuts in public expenditure resulting from the rollout of Universal Credit and reductions in associated means-tested family support. The UK received recommendations on infrastructure from 2012 to 2014, and again in 2016. The government has set out ambitious plans to remedy shortfalls in network infrastructure in its National Infrastructure Delivery Plan. It has also improved the assessment of long-term challenges and opportunities through the production of the National Infrastructure Assessment. While tangible progress to date has been modest and pressure on networks is building, the UK is starting to deal with the cumulated effects of decades of public under-investment in infrastructure. The UK has made some ( 6 ) progress in addressing the 2018 country-specific recommendations (CSRs). The UK currently has three CSRs. CSR 1 on fiscal issues is not assessed in this country report. There has been some progress on CSR 2, which relates to housing supply. Annual net housing supply has increased significantly from post-crisis lows. However, the recovery in house building has lost momentum since mid-2017, and it is now stabilising at a level below what would be necessary to meet estimated demand. Real house prices are stabilising and real rents are now falling slightly, but the cost of housing remains high. The government has recently extended and revised a number of existing housing policies. The rules on local authority borrowing to build public housing have been relaxed, but wholly new initiatives have otherwise been relatively limited. The UK has made some progress in addressing CSR 3 on skills and apprenticeships. Skills mismatches persist and shortages are starting to become acute as the labour market tightens and vacancies reach record levels. The implementation of the apprenticeship reform is facing difficulties, with low registration rates and employers facing a considerable administrative burden and confusion with regard to the functioning of the Apprenticeship Levy. The UK is a beneficiary of European Structural and Investment Funds (ESI Funds) support and can receive up to EUR 16.4 billion (GBP 14.5 billion) by 2020. This represents around 3.7 % of annual public investment ( I ) in 2014-2018. By 31 December 2018, an estimated EUR 11.2 billion (GBP 9.9 billion) (68 % of the total) had been allocated to projects on the ground. In addition, EUR 347 million (GBP 307 million) has been allocated to specific projects on strategic transport networks through a dedicated EU funding instrument, the Connecting Europe Facility. Numerous research institutions, innovative firms and individual researchers benefited from other EU funding instruments, in particular Horizon 2020, which has granted EUR 5.1 billion (GBP 4.5 billion) in investments. EU Funds help to both address structural policy challenges and implement country-specific recommendations. The financing goes towards the promotion of R&D investment in the private sector; the strengthening of SME competitiveness and the stimulation of closer collaboration between enterprises and knowledge institutions. In addition, investments in renewable energy sources and energy efficiency contribute to the necessary shift to a low carbon economy. EU Funds, in particular the European Social Fund, are also used to support various training activities including investment in education and life-long learning. These activities focus on the upskilling and reskilling of both the employed and unemployed as well as helping the long-term unemployed and “inactive” youth find employment. There is also investment in the promotion of social inclusion and measures to decrease poverty and discrimination. The investment of EU funds is expected to trigger additional national private and public investment of EUR 10 billion (GBP 8.8 billion). In order to attract this private investment, the use of financial instruments has significantly increased: more than 20 % of the funds are being invested in the form of loans, equity and guarantees. In addition, a guarantee of EUR 2.3 billion (GBP 2 billion) from the European Fund for Strategic Investments, is set to trigger EUR 21 billion (GBP 18.6 billion) in additional private and public investments. The UK ranks 24th as regards the overall volume of approved operations as a share of GDP. The ‘Infrastructure and Innovation’ window comprised 23 approved projects financed by the EIB with EFSI backing, for a value of approximately EUR 1.6 billion (GBP 1.5 billion) of financing in total, set to trigger EUR 17 billion (GBP 15 billion) in investments. Under the SMEs component, the country saw the approval of 18 agreements with intermediary banks or funds financed by the European Investment Fund (EIF) with EFSI backing. These amounted to EUR 636 million (GBP 562 million) in financing set to trigger approximately EUR 3.8 billion (GBP 3.4 billion) in investments, with some 2 979 SMEs and mid-cap companies expected to benefit from improved access to finance. An example of an EFSI-backed project in the UK is the construction of the Galloper Wind Farm 27 km off the Suffolk Coast, for which the EIB is providing EUR 314 million (GBP 278 million). Once operational, the wind farm will be capable of providing enough clean energy to supply up to 336 000 homes from 56 of the world’s largest wind turbines. The project is set to create over 700 jobs during construction and nearly 100 once operational. At 34.1 %, the UK's tax-to-GDP ratio remains well below the GDP-weighted EU average of 39 % (Table 3.1.1). Total UK tax revenues increased by 4.2 % between the fiscal years 2016-2017 and 2017-2018. In the 2018 Autumn Budget, the UK government announced a series of measures over the period 2018-2019 to 2023-2024, involving net tax cuts amounting to GBP 2 billion (EUR 2.3 billion) (OBR, 2018a). A new digital services tax of 2 % levied on revenues of certain digital businesses attributable to UK users will be introduced in April 2020. The tax burden on labour is among the lowest in the EU across the income scale. Personal income tax and National Insurance contributions make the biggest contribution to tax revenues. At 28.8 % of the average wage for a two-earner couple with two children, the UK’s tax wedge is one of the lowest in the EU (the EU average was 36.7 % in 2017) ( 7 ). It is expected to decline further as the government has announced that it will be raising the income tax personal allowance to GBP 12 500 (EUR 14 100) and the higher rate threshold to GBP 50 000 (EUR 56 550) from 2019-2020 (HM Treasury, 2018). At 2.9 % of GDP in 2017, corporate tax revenues are broadly in line with the EU average (2.7 %), but some elements of the tax system may discourage corporate investment. Corporate tax revenue increased by 3.3 % in 2017-2018, with the financial and manufacturing sectors seeing the largest increases (19 % and 12 % respectively) (HMRC, 2018a). As discussed in previous country reports, some elements of the tax system may discourage corporate investment. The effective marginal tax rate for new investment stood at 23.6 % in 2017, one of the highest rates in the EU (ZEW, 2017), largely due to property taxation and the capital allowance regime. To address a gap in this regime, the government announced a new structures and buildings capital allowance of 2 %, and a temporary increase in the Annual Investment Allowance for qualifying plant and machinery to GBP 1 million (EUR 1.13 million) from January 2019 to December 2020 (HM Treasury, 2018). The UK tax system appears to be one of the most attractive for ‘treaty shopping’ on dividend income (European Commission, 2018c). Treaty shopping may be used by companies that engage in aggressive tax planning and is the practice of structuring a business to take advantage of more favourable tax treaties available in certain jurisdictions. In this context, international companies may use the UK’s tax-exemption of dividends received from abroad and the lack of a withholding tax on outbound dividends paid, together with corporate tax residency rules to legally divert dividend flows with the aim of reducing or eliminating the tax burden ( 8 ). The UK is acting to curb aggressive tax planning through the implementation of European and internationally agreed initiatives. The UK has implemented rules in its domestic legislation for ATAD1 ( 9 ), effective from 1 January 2019. The UK’s controlled foreign company (CFC) rules are currently subject to an investigation by the Commission on whether the rules allow multinationals to pay less UK tax, which would be in breach of EU State aid rules (European Commission, 2017a). Where not covered by existing rules, the ATAD2 provisions on hybrid mismatches ( 10 ) will be transposed into UK legislation as from 1 January 2020. The UK has broadly transposed the provisions of the OECD Action Plan on Base Erosion and Profit Shifting (BEPS) where necessary ( 11 ). It will be important to assess to what extent the implementation of ATAD and BEPS will limit the scope for aggressive tax planning in the UK. There is some scope for the UK to increase VAT revenue efficiency. At 11.7 % in 2016, the UK VAT gap — the difference between expected and actual VAT revenues — was slightly lower than the EU average (12.3 %). At 17.9 %, the actionable VAT policy gap due to exemptions and reduced rates was slightly higher than the EU average (16.5 %) (CASE, 2018). In addition to its standard 20 % VAT rate, the UK applies a reduced rate of 5 % and a super-reduced rate of 0 % ( 12 ). 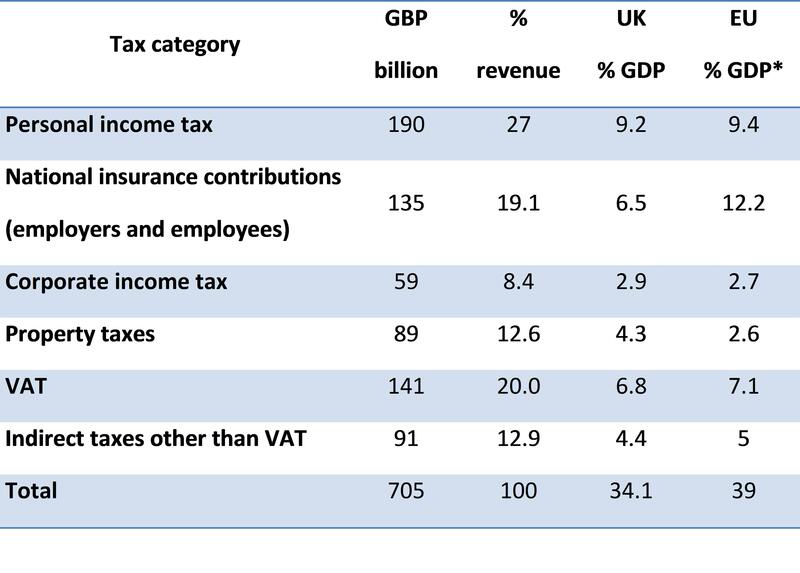 Revenues foregone due to reduced VAT rates are estimated at GBP 52 billion (EUR 59 billion) or 2.6 % of GDP in 2017-2018 (HMRC, 2018b). Hence, limiting the use of exemptions and reduced VAT rates, and strengthening tax compliance could further increase the VAT revenue efficiency. The UK is introducing new digital record keeping rules and VAT return requirements, to make the VAT administration more effective, more efficient and simpler for taxpayers. Despite high general government debt, there are currently no substantial short-term fiscal risks. General government debt peaked in 2016-2017 at 86.4 % of GDP. Debt has started falling since 2017-2018, and this declining trend is expected to continue over the forecast period. The value of the Commission’s early-detection indicator of fiscal stress S0 (indicating risk due to high level of gross financing needs, of the primary deficit and of public debt) remains below its critical threshold (see also Annex B). Low and stable spreads and high ratings reflect the financial market’s favourable perceptions of sovereign risk. Over the medium term, fiscal sustainability in the UK is deemed to be at high risk from a debt sustainability analysis (DSA) perspective. The Commission’s medium-term fiscal sustainability indicator S1 points to medium risk, due to the high initial debt ratio and the projected increase in age-related spending. However, overall, the UK is deemed at high risk on the basis of the DSA scenario analysis. In the DSA baseline scenario government debt is expected to steadily decline, but remain relatively high at 74 % of GDP in 2029 (see Graph 3.1.1). If fiscal policy reverted to historical behaviour with the structural primary balance (SPB) converging to the 15-year historical average deficit of 2.1 % of GDP, government debt could increase to 97 % of GDP in 2029. In contrast, if fiscal policy evolved in line with the main provisions of the Stability and Growth Pact (SGP), government debt would decrease substantially, to 67 % of GDP in 2029 (Annex B). The UK is also assessed to be at high fiscal risk over the long term, if future levels of the structural primary balance were similar to historical ones. 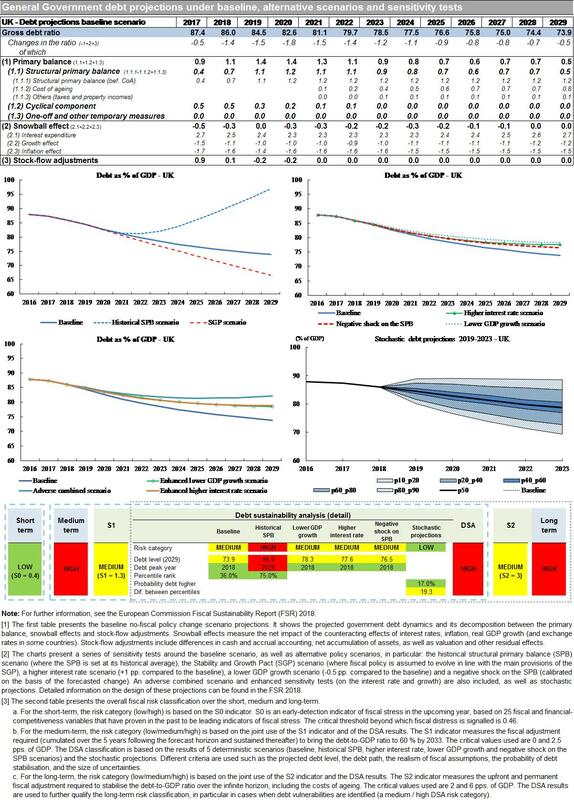 The Commission’s long-term sustainability gap indicator S2 points to a medium risk. This is due to the projected increase in public pension, health and long-term care expenditures requiring the UK to improve the SPB (a positive fiscal gap at 3 % of GDP). However, the DSA historical scenario, assuming an SPB converging towards the 15-year average deficit of 2.1 % of GDP, involves a significant increase in debt levels and therefore a high risk overall. In its latest Fiscal Sustainability Report, the Office for Budget Responsibility (OBR, 2018b) projects public finances to come under pressure over the long term due to an ageing population as well as higher health costs stemming from improved technology and treatments. International Monetary Fund analysis shows that the UK has a relatively low level of net public assets (IMF, 2018). The health system has been under financial pressure in recent years. Growth in government spending on healthcare has not kept pace with the increased demand for health services. Providers of services for the National Health Service (NHS) have been experiencing budget deficits and the financial pressure has started to affect performance (see Section 3.3). A recent report (IFS & The Health Foundation, 2018) calculates that real age-adjusted per-capita health spending increased by 0.1 % a year from 2009-2010 to 2016-2017. It concludes that to maintain provision of health services at current levels, spending on healthcare will have to rise by an average 3.3 % a year over the next 15 years — and the increases will need to be front-loaded at 4 % a year over the next five years in order to address the backlog of funding problems. It indicates that if services were to be improved — e.g. to meet waiting list targets —healthcare spending would have to rise by at least 4 % a year over the next 15 years, again front-loaded at 5 % a year for the next five years. In June 2018, the UK government committed to providing NHS England with an average 3.4 % a year real-terms funding increase over the next five years. The 2018 autumn budget confirmed this, allocating an additional GBP 20.5 billion (EUR 23.2 billion) for NHS England by 2023. This automatically implies extra money for Scotland, Wales and Northern Ireland, although it will be up to these devolved administrations to decide how to spend the money. This increase will support the first half of the delivery of the NHS Long Term Plan, released in January 2019, which sets out a list of ambitions for the NHS by 2028. The NAO (2019) welcomes the long-term approach, but notes that the funding settlement does not include key areas of health spending, namely capital investment for buildings and equipment, disease prevention initiatives and training for the healthcare workforce. It will only be possible to fully judge the future impact of the settlement once the upcoming Spending Review sets out future funding in these complementary areas. In the 2018 Autumn Budget, the UK government confirmed the fiscal rules set out in the January 2017 Charter of Budget Responsibility. Previously, fiscal rules were revised frequently, making it more difficult to predict policy in the medium term. The overall fiscal objective set out in the Charter is to return public finances to balance by the mid-2020s. The fiscal targets are: the reduction of the structural deficit below 2 % of GDP by 2020-2021 (the fiscal mandate); a fall of public sector net debt as percentage of GDP in 2020-2021 (the supplementary target); and a ‘welfare cap’, setting a limit on welfare spending. The Charter sets out that HM Treasury can review the fiscal rules in the event of a significant negative shock to the UK economy. While the current assessment of compliance with the fiscal targets is favourable, some downside risks could prevent the UK from complying with the fiscal rules in the medium term. The OBR expects the government to meet all three fiscal targets (OBR, 2018a). While the mid-2020s is beyond its forecast horizon, the OBR judges that meeting the fiscal objective could be challenging. 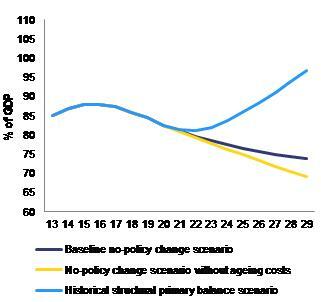 On the expenditure side, pressures due to an ageing population pose risks. Also the upcoming ‘Spending Review’ in 2019 could lead to higher medium-term expenditure plans, possibly further calling into question the medium-term fiscal objective of a balanced budget by the mid-2020s. The UK banking system has continued to improve its capital position and is now much stronger than it was before the global financial crisis. UK banks’ capital strength has more than tripled since 2007, with an aggregate Common Equity Tier 1 (CET 1) capital ratio of 15.0 % in Q22018 (see Table 3.2.1). The level of capital that banks are required to hold has also increased significantly. This means that the banks that were in the weakest position before the financial crisis have had to strengthen their position the most. The improvement in banks’ risk-weighted capital ratios reflects both an increase in capital resources and a reduction in the size and riskiness of banks’ balance sheets. On a nonrisk-weightedbasis, banks’ leverage ratios have also improved. UK banks have become more profitable, but challenges remain. The rise in earnings has been driven primarily by income rising against a falling cost base and the benign credit environment, which has seen reduced impairments as compared with previous years. This has helped banks improve their capital ratios through retained profits. However, a number of challenges to profitability persist. In particular, costs relating to past misconduct are still likely to affect profitability in the coming years, while strong price competition is pushing margins down in some areas, such as mortgages. The effect of uncertainty related to the UK’s withdrawal from the EU also has a dampening effect on banks’ earnings, as business investment is subdued. UK banks’ liquidity position remains strong. Since the financial crisis, major UK banks have substantially reduced their reliance on wholesale funding. A combination of their own liquidity resources and access to central bank facilities covers short-term liabilities prone to risk. On aggregate, the largest UK banks hold good levels of loss-absorbency resources. Resources to meet the minimum requirements for own funds and eligible liabilities (MREL) represent 25 % of their risk-weighted assets (RWA) against a 2022 requirement of 29 %. In order to gradually fill this gap, banks are continuing to issue new debt. At the end of May 2018, total issuance of term debt (loans with a specified repayment schedule and due to mature in at least one month) was over 60 % higher than at the equivalent points in 2016 and 2017. The 2018 European Banking Authority (EBA) stress test produced unexpectedly weak results for UK banks, at least compared to peers (EBA, 2018). Two major UK banks were among the worst three performers in the EBA exercise, reflecting their susceptibility to weak growth, credit losses and uncertainty related to the UK’s withdrawal from the EU. The 2018 Bank of England stress test showed that the UK banking system would be able overall to withstand a global recession that was more severe than either the 2008 crisis or the estimated impact of a disorderly Brexit (BoE, 2018). The Bank judged that none of the seven banks involved in the exercise needed to strengthen their capital position as a result of the exercise. As well as the exact scenarios, an essential difference between the EBA and Bank of England stress tests is that the former applies a constant balance sheet methodology, which does not allow for strategic management action by the banks, such as conversion of subordinated debt into equity. New ringfencing requirements took effect in January 2019. These require UK banks with more than GBP 25 billion (EUR 28 billion) of deposits from households and businesses to separate the provision of core services from other activities within their groups, such as investment banking. The requirements are known as structural reform or ‘ring-fencing’. Ring-fenced banks will provide the bulk of UK retail banking services and be kept separate from other parts of the banking group. The Bank of England’s Financial Policy Committee is maintaining the UK countercyclical capital buffer (CCyB) rate at 1 %, as it judges that domestic risks, apart from those related to Brexit, remain at a standard level overall. The availability and affordability of housing in the UK remains a major challenge. Annual net housing supply has increased significantly from post-crisis lows, but it is now stabilising at a level below what would be necessary to meet estimated demand. Regulation of the land market is strict and complex. Shortages of housing and high housing costs are particular issues in areas of high and growing demand, such as in and around urban centres. The government recognises the problem and has put in place a range of policy initiatives and set ambitious objectives to increase supply in the coming years. At the same time, it has reaffirmed its commitment to limiting development in the green Belt around urban centres. Home ownership has fallen for younger people, contributing to intergenerational inequality. House prices are high, especially in areas of high demand. Valuation metrics continue to suggest significant overvaluation in the housing market. The average UK house price was GBP 231 000 (EUR 261 000) in November 2018 (ONS, 2018a). The ratio of median house prices to median annual earnings rose to a new record high of 7.8 in 2017 (ONS, 2018c) and the Commission estimates that, nationally, UK housing is around 20 % overvalued. In London, the average price of properties bought by first-time buyers (smaller and cheaper than average properties) is 13 times average earnings (ONS, 2018d). Young adults have largely been priced out of home ownership. Housing transactions remain well below pre-crisis levels. A third of house purchases are now made without a mortgage, much higher than before the crisis. This reflects stretched affordability and intergenerational inequality (Resolution Foundation, 2017). Home ownership has declined overall in recent years, especially among younger adults on middle incomes. In 1995-1996, 65 % of those aged 25-34 with incomes in the middle 20 % for their age owned their home, but by 2015-2016 the proportion had fallen to only 27 % (IFS, 2018a). The likelihood if young adults owning a house has become much more dependent on their parents’ level of property wealth, with negative implications for social mobility (Resolution Foundation, 2018). The housing market has cooled, particularly in the most expensive areas. Real house prices rose quite rapidly from 2014 to 2016, before easing in 2017 (Graph 3.2.1). Indicators of housing market activity (both supply and demand) were quite flat through 2018. Nominal national house price growth (year-on-year) fell to 2.8 % in November 2018 (ONS, 2018a), only marginally above consumer price inflation. The growth in the price of buying and renting property has slowed most in the most expensive regions. In London, nominal house prices declined by 0.7 % in the year to November 2018. Private housing rent growth has also fallen gradually steadily, to 1.0 % yearonyear in December 2018 (ONS, 2018b). With high economic uncertainty, fragile consumer confidence, and weak surveyor expectations of near-term price movements and transaction volumes, housing activity and prices appear set to remain subdued in the short term (RICS, 2018). Mortgage debt is high but there are limited signs of associated financial distress. In recent years, high loan-to-income mortgage lending has edged up in a context of low unemployment, cheap credit and high house prices. This has contributed to persistently high household debt (see Section 1). The Bank of England has taken macroprudential steps to curb risky mortgage lending and started to tighten monetary policy (see Section 1). 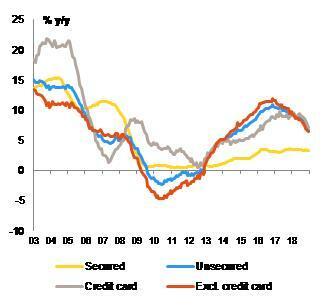 Secured credit to households is still growing, but only marginally. Following a long, gradual decline, interest rates on new mortgages have bottomed out. The scope for households to benefit from remortgaging has diminished. While the average ‘mortgage to median income ratio’ continues to rise (UK Finance, 2018a), the proportion of new mortgages with a ‘loan to income ratio’ of 4.5 or above remains well below the FPC’s recommended limit of 15 % (ibid.). Mortgage arrears and repossessions remain low (UK Finance, 2018b). The post-crisis recovery in house building has lost momentum. 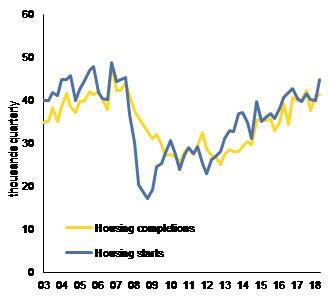 As shown in Graph 3.2.2, new housing starts have been on a slight downward trend since peaking in early 2017. Completions also seem to have plateaued. The number of net additional dwellings rose by 2 % to 222 190 in 2017-2018, a much smaller annual increase than the 14 % rise in the previous year (MHCLG, 2018a). While new build completions are still rising, office-to-residential conversions fell by a third from their 2016-2017 peak. The official level of annual demolitions is very low (one in 3 000 dwellings), which has implications for the pace at which the housing stock modernises and becomes more energy-efficient. Tight, inflexible regulation of the land market limits the scope for residential development. As discussed in previous country reports, the process of obtaining planning permission is complex and costly. The ‘green belt’ policy was put in place to contain urban sprawl and keep broad swathes of land around existing conurbations permanently open. After growing through the post-war period, the amount of land designated as green belt has remained broadly fixed in recent years. This restricts the scope for the expansion of major urban centres. For example, London’s green belt now covers over half a million hectares, and is about three times larger than London itself. The government has committed to maintaining the green belt in its current form, which does not directly distinguish between areas of high environmental amenity value and other areas. This has prevented housing supply from responding adequately to shifts in demand and inflated the price of land used for housing. The tight regulation of the land market affects the efficiency of the labour market and wider economy, with distributional consequences. On average, 70 % of the price paid for a home is now accounted for by the value of the land, and only 30 % by that of the property itself (IPPR, 2018), though this average masks significant variation. The planning system and high cost of building land has contributed to increasing concentration in the residential construction sector and created barriers to entry for smaller firms. Builders’ profitability is heavily dependent on land-price dynamics and it can make commercial sense for them to focus on maximising margins rather than volume (Bentley, 2017). Housing demand is set to continue to outstrip supply although estimates of household formation have been revised down. The Office for National Statistics (ONS) now expects the number of households in England (about 85 % of the UK population) to increase by an average of 159 000 a year over the next 25 years (ONS, 2018e). This is much less than the 210 000 projected previously. To keep up with demand, gross residential construction will need to be significantly higher than this, to replace demolitions and accommodate geographical shifts in the population. High housing costs may also have suppressed household formation, for example by forcing young adults to live at home or cohabit as renters for longer. Average household sizes have stagnated in England, while continuing to fall in most of the rest of the developed world. The scope for faster house building is also limited by skills shortages. The construction sector lost much of its skills base in the bust following the financial crisis. Output per hour in construction has fallen over the last decade (see Graph 3.4.2) and the sector has the lowest labour productivity of any major sector in the UK economy (ONS, 2018f). Construction employment increased by 3.8 % in 2017 (ibid.) and the Construction Industry Training Board estimates that building companies need an extra 35 000 people a year. One means of mitigating skills and capacity shortages may be to make greater use of modern construction methods. The government is implementing a range of policy initiatives to boost housing supply. Its 2017 white paper, Fixing Our Broken Housing Market (DCLG, 2017), set out four broad policy objectives for housing. These are: (i) increasing the supply of land available for house building; (ii) accelerating the rate of house completions; (iii) encouraging more diversity in the building industry; and (iv) providing support to homebuyers. A revised National Planning Policy Framework (NPPF) is in place. Further updates to the NPPF in 2018 included a standardised methodology to determine minimum housing need in each local authority area. There has been progress in issuing more residential planning permissions, with permission for 359 500 housing units granted in the year to September 2018 (MHCLG, 2018b). The government is increasingly focusing direct public support for house building on areas with the highest housing demand and prices. Recent measures have largely involved extending and revising existing policies. The Housing Infrastructure Fund supports the funding and planning of infrastructure linked to housing developments. In the 2018 Autumn Budget, it was increased by GBP 500 million (EUR 566 million) to GBP 5.5 billion (EUR 6.22 billion), to be used by 2022-2023. The British Business Bank (see Box 3.4.1) will deliver a new scheme that will provide guarantees supporting up to GBP 1 billion (EUR 1.13 billion) of lending to SME house builders. The government has consulted on proposals to allow housing to be more easily built above commercial premises, or in their place (MHCLG, 2018c). The ‘help to buy’ equity loan scheme will be extended by a further two years, to 2023. By increasing the amount buyers can borrow, it may have contributed to more rapid price growth in newbuild properties. The government has relaxed rules on local authority borrowing to build public housing. In its 2018 Autumn Budget, it removed the caps on the amount that local authorities can borrow through ‘housing revenue accounts’. This is a much more significant measure than the limited increase in the caps announced in 2017. Since 2010, local authorities have been constructing an average of only around 1 500 homes a year (1 % of total building). The scope for increased borrowing will allow them to build more homes, but it is not yet clear on what scale and the possible financial risks are still unclear. The government estimates that it could eventually enable local authorities to build up to 10 000 homes a year. However, not all local authorities have the necessary experience and skills to be able to make use of this new freedom in the short term. A review was carried out to address a growing gap between planning permissions and house building volumes. Planning permission for 359 500 homes was given in 2017-2018, but only 195 290 new homes were built. This gap has been getting wider. The Independent Review of Build Out, published alongside the 2018 Autumn Budget (HM Government, 2018), found no evidence that speculative land banking by major house builders is a driver of slow buildout rates. It concluded that the binding constraint on buildout rates by profit-maximising house builders is the rate at which the market would absorb new homes of a particular type on a large site. Greater differentiation in the types and tenures of housing delivered on large sites could therefore help to accelerate construction. The government welcomed the review and will formally respond to its recommendations shortly. Despite positive labour market figures, challenges persist. The activity rate continued to rise steadily, to 81.5 % in Q3 2018 (as against 78.4 % in the EU). Employment remains at record levels (78.6 % in Q3-2018) and unemployment has fallen further, to 4.1 % in Q32018. The long-term unemployment rate was 1.1 % in Q32018. Labour market conditions appear more nuanced when taking into account the relatively high underemployment, issues as regards the quality of jobs, and gender and disability employment gaps. Furthermore, while there are no significant spatial disparities in employment, regional differences in productivity and living standards are large (see Section 3.4.3). There has been an increase of precarious work and zero hour contracts. Recent evidence from the Trade Union Confederation (TUC, 2017) estimates that 3.2 million (one in ten) UK workers face insecurity at work, either because of contracts that do not guarantee regular hours or income, or because of low-paid self-employment (earning less than the National Living Wage ( 13 )). This number has risen by 27 % over the last five years, with research by the Centre for Labour and Social Studies (CLASS, 2018) showing a clear correlation between insecure work and lower productivity. Precarious and insecure work also offers substantially lower social and employment protection, fewer rights and often diminished employee power of representation. The lack of a long-term commitment between firms and workers, and the use of temporary contracts, lead to lower investment by firms in skills and training, which in turn, has a negative impact on productivity growth (European Commission 2018e). It remains to be seen how far the Good Work Plan, a package of measures to support the most vulnerable workers issued in December 2018, will address this. Improving the quality of employment would help to raise productivity. As discussed in Section 3.4.1, productivity has been stagnant since the beginning of the crisis and is now over a sixth below its pre-crisis trend (ONS, 2018f). This has weighed on real wage growth, which remains low while UK employment has been growing strongly. The government’s Review of Modern Working Practices (Taylor, 2017) sought to address this challenge by setting out a list of five principles to underpin the quality of work in the future: overall worker satisfaction, good pay, participation and progression, wellbeing, safety and security and voice and autonomy. The Industrial Strategy Council, established in October 2018, is tasked with providing advice on measuring the quality of work. Career progression is still hard to achieve for workers on low wages. Real wages have been stagnant or declining for almost a decade (see Section 1). With constant pressure on household budgets, many workers are turning to second jobs or quick access to credit to plug shortfalls. A recent survey among UK workers found that 20 % of sampled workers have taken on a second job to try to make ends meet, while a further 20 % have either tried or contemplated it (CLASS, 2018). In addition, of those who are working outside normal office hours or during weekends, almost 70 % do not receive extra pay. These factors, combined with the rise of precarious employment, mean that career advancement prospects and improved quality of work remain unattainable for a large proportion of UK workers. The proportion of businesses reporting labour shortages is relatively high compared to other Member States. It has increased since the start of the recovery, from 11.4 % in 2013 to 23.7 % in 2017 (European Commission, 2018d). Reported shortages are higher in services (25 % in 2017) than in industry (21.9 %) and the building sector (15.4 %). They are particularly noticeable in transport, accommodation, food and beverage services, employment activities, and services to buildings and landscape activities. These are also the sub-sectors with the biggest increase in shortages in recent years. Overall, the proportion of reported shortages remains below the pre-crisis level for the services and industrial sectors. The European Pillar of Social Rights is designed as a compass for a renewed process of upward convergence towards better working and living conditions in the European Union ( II ). It sets out twenty essential principles and rights in the areas of equal opportunities and access to the labour market; fair working conditions; and social protection and inclusion. 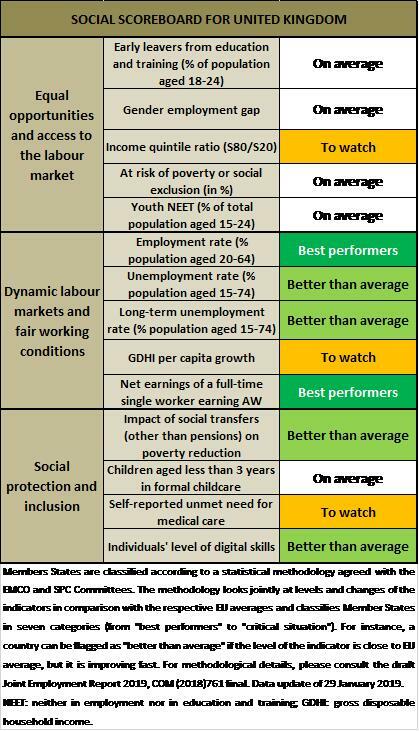 The UK performs relatively well on a number of indicators of the Social Scoreboard supporting the European Pillar of Social Rights, but some challenges remain. The labour market displays robust figures in terms of participation rates, employment creation and youth- and long-term unemployment. However, there are an increasing number of underemployed people who would like to work more hours in their jobs but are unable to do so. There has been a considerable rise of zerohour contracts, which are characterised by lower levels of social protection, skills progression and productivity. Despite the decline in poverty and social exclusion overall, certain groups remain at a higher risk. Circa 14 million people live under the poverty line. The proportion of people with disabilities who are at risk of poverty or social exclusion is higher than the EU average. Child poverty is high, and it is projected to rise. Rates of in-work poverty are also up, particularly for parents. Furthermore, homelessness, including among children, has increased considerably and is predicted to continue rising in the coming years. Upskilling of the adult workforce is being strengthened. The National Retraining Scheme provides career advice and job-specific training. Although uptake remains slow, the reform of the apprenticeship system is on-going and has been boosted by new government investment in the levy scheme and greater employer involvement. The gender employment gap remains a challenge. Despite some improvements in the last few years, the activity rate among women remains 10.4 pps lower than that among men (76.4 % vs 86.8 % in Q32018). A main driver seems to be the difficulty in reconciling professional and caring responsibilities, which is aggravated by the shortfall in care services (see sub-section on healthcare). A significant proportion of inactive women (38.4 % in 2017) have caring responsibilities that prevent them from seeking work (Graph 3.3.1). These figures are more striking for the 25-49 age group, where up to 61 % of inactive women ascribe this to family responsibilities. In addition, 41.5 % of women working part-time (in 2017) do not work more due to caring responsibilities. These rates are amongst the highest in the EU, despite the fact that the government maintained investment in childcare after the financial crisis and more recently extended the 30-hour entitlement to free childcare for 0-3 year olds. Skills mismatches remain low at the macroeconomic level. Disparities between the employment rates of low-, medium-, and high-skilled workers were among the lowest in the EU in 2017 (Graph 3.3.2). However, skills shortages as measured by employer surveys are high (see above), and there is a relatively high share of mismatch between the skills workers have and the requirements of their jobs. Source: Own calculations based on Eurostat. Annual average based on the average of four quarters. Measures have been put in place for in-work upskilling. The 2018-2019 budget allocates GBP 100 million (EUR 113 million) for the first phase of the National Retraining Scheme in 2019. This will include a new careers guidance service with expert advice to help people identify work opportunities in their area, and courses combining online learning with traditional classroom teaching to develop key transferable skills. Phase two of the National Retraining Partnership between the government, the Confederation of British Industry and the Trade Union Congress will focus on jobspecific retraining. Implementing the apprenticeship reform is proving a challenge, with registrations down on previous years. The Apprenticeship Levy introduced in 2017 is a charge on employers which can be used to fund apprenticeship training. Provisional figures show that the number of people who started an apprenticeship in July 2018 (25 300) was up 20 % on July 2017 (just two months after the levy came in), but down when compared to the same time in previous years (43 % compared to July 2016). Just 8 % of levy funds collected in the first year were spent. A recent report (CIPD, 2018) shows that there is still considerable confusion and uncertainty about the Apprenticeship Levy among employers, particularly SMEs. The reform of the vocational training system will involve new classroom-based training programmes and work-based apprenticeships known as ‘T-levels’. However, of 15 T-level qualifications being developed, only three will be available by 2020. A further package of measures was announced in the 2018 Autumn Budget to complete the apprenticeship reforms. A total of GBP 450 million (EUR 510 million) will be made available to enable levy-paying employers to transfer up to 25 % of their funds to pay for apprenticeship training. The government will also provide up to GBP 240 million (EUR 270 million), to halve the co-investment rate for apprenticeship training to 5 %. A further GBP 5 million (EUR 5.7 million) in 2019-2020 will help the Institute for Apprenticeships and the National Apprenticeship Service to identify gaps in the training provider market and increase the number of employer-designed apprenticeships. As skills policy is a devolved matter, these administrations will be free to choose how to spend the funds raised from the levy. Local Industrial Strategies will further complement regional apprenticeship investment policies to meet employers skills needs. The expected impact of these measures will be more flexible training tailored to employers’ real needs, resulting in greater involvement in the scheme by the business community. Government expenditure on education fell in 2016 compared to 2015, but remains in line with the EU average. Education spending dropped as a share of GDP, from 4.9 % in 2015 to 4.7 % in 2016 (equal to the EU average), and as a share of total government expenditure from 11.5 % in 2015 to 11.2 % in 2016 (still above the EU average of 10.2 %). The most significant budget cuts affected higher education (from 7.1 % to 4.8 % of total general government expenditure). In England, an increasing number of schools are in deficit and finding it difficult to remain financially viable. Nevertheless, according to Canton et al. (2018), the efficiency of public spending — measured with respect to tertiary educational attainment, PISA scores and the proportion of young people not in employment, education or training (NEET) —is relatively high. The rate of early leavers from education and training is close to the 2020 benchmark of 10 %, but with significant regional variations. The UK’s average rate dropped from 14.9 % in 2011 to 10.6 % in 2017, the same as the EU average. However, at regional level rates range from 6 % in London to 13.9 % in Yorkshire and the Humber and the East of England. Unlike in other EU countries, the early school leaving rate is lower among students born abroad (9.5 %) than those born in the UK (10.8 %). Boys are more likely to leave school early than girls (12.1 % vs. 9 %). Concerns persist over the training, recruitment and retention of teachers. Teacher recruitment in England has not kept pace with increases in pupil numbers (Sibieta, 2018). Up to 40 % of new teachers leave the state school sector after five years and there are shortages of maths, physics and modern foreign language teachers across schools in England (Stiell et al., 2018). In addition, poorly performing schools find it hard to recruit well-qualified teachers. The House of Commons Public Accounts Select Committee has called for action plans to address the problem of retaining teachers and the variations in the quality of teaching across the country (House of Commons, 2018a). Initiatives for training and recruiting teachers have been launched in England, Wales and Scotland. Potential changes to the UK’s immigration policy could have a negative impact on research and teaching prospects. According to Universities UK (2018), over 400 000 international students came to study in the UK in 2016-2017, representing 19 % of all students. On average, every student from another Member State generated (through expenditure on tuition fees and subsistence) GBP 22 000 (EUR 24 900) gross added value and GBP 5 000 (EUR 5 650) in tax receipts. International staff made up 20 % of all university staff and 30 % of all academic staff in 2017 (up to 43 % for some subjects such as engineering) (ibid.). Around 11 % of the UK Higher Education sector’s GBP 7.9 billion (EUR 8.9 billion) research income in 2016-2017 was from European sources, the majority (9 % of the total) coming from EU funding. Participation in tertiary education is widening but equal access is an obstacle. The UK tertiary educational attainment rate reached 48.3 % in 2017, one of the highest in the EU and well above the EU average of 39.9 %. The National Audit Office has looked at the impact of student loans and course fees in a context of widening participation (NAO, 2017). While students from disadvantaged backgrounds are now more likely to participate in higher education, they remain underrepresented and most are enrolled by lower-ranked institutions. The Scottish and Welsh governments are adopting several measures to encourage students from a deprived background to study for a degree. Mental health and wellbeing among students are concerns. Levels of mental illness, mental distress and low wellbeing among students in higher education are increasing. Nearly five times as many students as 10 years ago disclosed a mental health condition to their university (Thorley, 2017). Universities UK has established a ‘Student Mental Health Services Task Group’ acknowledging that higher education needs to do more to cope with the rising level of mental health issues reported by 94 % of universities. High market income inequality is mitigated by an effective tax and benefits system, but wealth inequality is high. Income inequality is among the highest in the EU before taxes and transfers are taken into account (market income inequality). In 2016, the market income of the richest 20 % was over 16 times that of the poorest 20 % (ONS, 2018g). However, the impact of the income tax system and social transfers reduces disposable income inequality to slightly above the EU average. On the other hand, the top 10 % of the population owned 44 % of the UK’s wealth (ibid.). The risk of poverty or social exclusion has declined in line with the recovery but challenges lie ahead. In 2017, 22 % of the population was at risk of poverty or social exclusion (AROPE), down from a high of 24.8 % in 2013. The fall has been driven by substantial decreases in the percentage of the population experiencing severe material deprivation, which reached a new low of 4.1 % in 2017. In the South East of England, just 12 % were at risk of poverty in 2016-2017, and the figure was only slightly higher in the South West (13 %) and London (14 %) (House of Commons, 2018b). This contrasts with rates of around 20 % in Wales, Northern Ireland and the three regions in the North of England ( 14 ). Since 2015, the UK has had no official measure of poverty and there is no national poverty eradication strategy. However, a recent study by the Joseph Rowntree Foundation found that more than one in five people in the UK (22 %) are in poverty (JRF 2018). This is equivalent to 14.3 million people: 8.2 million working-age adults, 4.1 million children and 1.9 million pensioners. Eight million people live in poverty in families where at least one person is in work. Research by the Social Metrics Commission using a different methodology comes to very similar findings (SMC, 2018). People with disabilities are at a higher risk of poverty and exclusion. The proportion of people with disabilities who are at risk of poverty or social exclusion in the UK is 32.2 % (EU average: 30.1 %). The AROPE gap between people with and without disabilities is wider than the EU average (14.6 pps vs 9.2 pps in the EU). The UK also has a much wider employment rate gap between people with and without disabilities than the EU (33.5 pp. vs the EU average of 25.8 pps). This is linked to high levels of early school leaving among people with disabilities ( 15 ). The Disability Employment Strategy addresses some employment issues, but it is not targeted at reducing poverty or social exclusion for people with disabilities who are unable to integrate into the labour market. The ‘Improving Lives: the future of work, health and disability’ strategy (DWP & DoH, 2017) will involve intensified and more personalised employment support for people with disabilities. Child poverty is high and predicted to rise further (Graph 3.3.3). The number of children in poverty in the UK has increased by 100 000 since 2017, to 4.1 million in July 2018. 30 % of all children are living in relative poverty after household costs. Children remain the most likely segment of the population to be in relative poverty, compared to 21 % of working-age adults and 16 % of pensioners experiencing poverty. Child poverty rates are highest in large cities, particularly London, Birmingham and Manchester. The IFS predicts a 7 % rise in child poverty between 2015 and 2022, and other sources predict child poverty rates to reach 40 % (IFS, 2017). The Equality and Human Rights Commission (EHRC, 2018) forecast that another 1.5 million children will fall into poverty by 2021-2022, raising the child poverty rate to 41 %. A number of sources (House of Commons, 2018b, p22), including the IFS, concur that the main drivers of the projected increase in child poverty are linked to cuts in public expenditure resulting from the rollout of Universal Credit and associated means-tested family support (see below). Huge under-investment by central Government in children’s social care services over the last decade has led to considerable overspending by local councils in this area. According to the Local Government Association (LGA), 132 out of 153 local councils in England, (88 %) overspent in 2017-2018, with the number of children in care at a ten year high. Universal Credit rollout continues to encounter delays and it will not be fully implemented before 2023. Universal Credit (UC) is a new integrated system of welfare benefits and in-work support that will replace six separate means-tested benefits and tax credits. It will ultimately pay out more than GBP 60 billion (EUR 68 billion) a year to around 7 million families. Its design and implementation have proven controversial. Recent IFS calculations show that UC will be GBP 1 billion (EUR 1.13 billion) less generous than the system it is replacing (IFS, 2018b). This may affect the adequacy of benefits ( 16 ). A recent (October 2018) report of by the Commons Select Committee (House of Commons, 2018c) has found that the UC IT system is under-performing and the administration is causing hardship for claimants and additional burdens for local organisations. According to the IFS, most single parents, low-earning self-employed people, and those in work and with savings are expected to fare less well than under the previous system. One-earner couples with children and low earners in rented accommodation will fare better. The Department of Work and Pensions will be outsourcing many of the application support functions to non-welfare-related organisations such as public libraries and Citizens Advice Bureaus. This could entail risks mainly on data protection but also on the handling of the claims and will require adequate resources and cooperation with delivery partners. Regular evaluations have been conducted during the pilot phases and more will be needed as rollout progresses. In January 2019, the Government has announced a series of changes to make the Universal Credit system fairer. These include not applying the two child limit on UC to any children born before April 2017, a measure expected to benefit around 15 000 families, and a pilot scheme to support 10 000 benefit claimants on to the new UC system before a vote takes place on migrating all claimants. Other issues to be reviewed include increasing the frequency of the payments to claimants, making budgeting easier and supporting women. Homelessness figures are on the rise and show no sign of abating. A shortage of housing supply and low levels of construction by local councils have driven up rents and limited access to affordable and social housing. According to research by the housing charity Shelter, at least 320 000 people are homeless in the UK (Shelter, 2018). This year-on-year increase of 13 000 (4 %) comes despite pledges to tackle the crisis. The Homeless Reduction Act, which came into force in April 2018, provides a new legislative framework for local authorities to refocus their work on preventing homelessness. The government has committed to maintaining Housing Benefit for all supported housing and halving rough sleeping ( 17 ) by 2022, and eliminating the phenomenon by 2027, in line with the Rough Sleeping Strategy. The implementation of childcare provision reforms has slowed down but investment has been maintained. September 2017 reforms involved the full roll-out of 30 hours per week in school term-time of free childcare for three and four year-olds whose parents are working (House of Commons, 2018d), and the launch of ‘tax-free’ childcare. At the end of September 2018, the government closed the childcare voucher scheme to new entrants, despite not having analysed winners and losers as suggested by the Treasury Select Committee. Universal Credit limits help with childcare costs to working parents, but this has been extended to those working under 16 hours and to a higher percentage of costs (up to certain ceilings). The 2018 Childcare Survey found that the ‘confusing hotchpotch of seven different types of support’ means parents are at risk of missing out on help (Family and Childcare Trust, 2018). Raising the childcare costs ceiling under Universal Credit and facilitating upfront payments for childcare would make it easier for parents to move into work. Similarly, simplifying the administrative procedures for applying for childcare benefits would result in more efficient and successful payment claims. Childcare supply varies across regions with after-school care insufficient in most of the UK. Childcare and early years education are devolved policy areas. The 2018 Childcare Survey found that 86 % of councils in Scotland had enough places for parents working full-time to access the three and four-year-old entitlement, but this applied to only 50 % in Wales and England (Family and Childcare Trust, 2018). Scotland plans to double free childcare for all three and four-year-olds to 30 hours/week in term-time by 2020. Taking Wales Forward (Welsh Government, 2016) commits the Welsh Government to providing 30 hours/week of government-funded early education and care for working parents of three and four-year-olds, for up to 48 weeks of the year. This has been available in more ‘early implementer’ local authority areas, or parts of them, since mid-2018 but take-up has been lower than budgeted for. In Northern Ireland there has been no legal requirement to meet childcare demand (Skinner, 2016). The majority of UK local authorities do not have enough capacity to address after-school care needs for children with disabilities or children whose parents work outside normal office hours. Shortfalls in the provision of social care services are placing an increasing burden on the National Health Service (NHS) and on informal, family carers. While competence for social care is devolved, access to social care is becoming increasingly restricted in all four UK countries. In England, spending on adult social care, which is largely delivered through local authority budgets, fell by 17 % from 2011-2012 to 2015-2016 (Glendinning, 2018), despite a significant increase in the population aged 65 and over. Unmet need for social care services also affects hospital bed use, with a significant proportion of delayed patient discharges caused by the unavailability of social case services (NHS England, 2018). At the same time, the number of family carers has been growing and fifth of them are themselves aged 65 or older (Glendinning, 2018). The rising demand for health services across the UK has outpaced resources in recent years, affecting the performance of the health system. As demand outstrips available financing, hospitals are struggling to meet targets such as the percentage of patients who start cancer treatment within 62 days of referral or who need to be admitted, transferred or discharged within four hours of arrival at accident and emergency departments (NAO, 2018a). All four nations of the UK aim to reform their health systems with more efficient models of care. In Scotland, Integrated Care Partnerships have been formed to integrate health and social care services. In England, early evidence from the Vanguards scheme suggests that its new care models can moderate the rise in emergency admissions to hospitals (NAO, 2018b). However, challenges are encountered when it comes to scaling up these models across England (NAO, 2018c), not least because funding earmarked to support the transition has instead been partly diverted to plug deficits in health providers’ budgets. The health sector faces staff shortages. The UK has fewer doctors and nurses per person than the EU average. There are 2.8 practising doctors per 1 000 population against an average of 3.6 in the EU (OECD/EU, 2018). In particular, there is a shortage of primary care providers, as the number of general practitioners per 1 000 population has dropped since 2010. In 2017, around 45 000 clinical posts, including 36 000 nursing vacancies in NHS England were not filled (Public Health England, 2017). Approximately 80 % of these vacancies are being covered by a combination of temporary staff. It is estimated that the NHS in England will probably require 64 000 more hospital doctors and 171 000 more nurses over the next 15 years (IFS & The Health Foundation, 2018). However, there are problems with the supply, recruitment and retention of health professionals. In 2014, the number of nursing graduates per 100 000 population was well below the EU average and it has not increased since then. According to the Nursing & Midwifery Council (NMC), there were fewer nurses and midwives on the NMC register in March 2018 than in March 2017, with a clear decrease in the number of nurses and midwives from European Economic Area (EEA) countries (NMC, 2018). The government is taking actions to address the challenges. It has announced a 25 % increase in medical school places from 2018-2019 and funding for 25 % more student nurse places from 2018. This could translate to an extra 26 000 trained nurses by 2027, while the additional graduate doctors are expected to become general practitioners or consultants around 2030-32 (Public Health England, 2017). Nevertheless, to fill the gaps in the coming years, the UK will have to continue recruiting doctors and nurses from abroad. Health Education England aims to recruit over 1 000 nurses a year from overseas from 2018-2019 onwards (DoH, 2018). UK productivity has long been quite low, due partly to low investment. The UK is an open economy with a high employment rate and a business environment featuring many positive aspects, including relatively free and efficient product, labour and capital markets. It ranks ninth among 140 countries in the World Bank’s classification of the ‘friendliness’ of national business environments (World Bank, 2019). However, these positive microeconomic conditions do not seem sufficient to improve UK productivity, which is significantly lower than that of other developed economies. Large parts of the economy perform comparatively poorly on the main potential drivers of productivity — skills (see Section 3.3), R&I (see below), investment (see Section 3.4.2) and the adoption and implementation of efficient business processes. The UK is an outlier for its low private investment as a proportion of GDP (ONS, 2017). There are also impediments to the efficient allocation of capital and labour, including a tightly regulated land market and associated housing shortage (see Section 3.2.2). Since the financial crisis, the UK’s productivity performance has been among the worst in the EU and the G7. 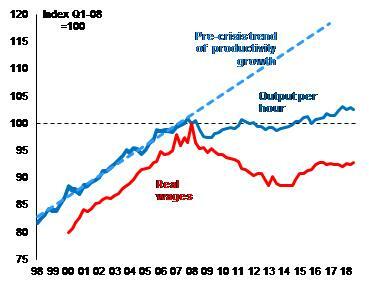 Output per hour is barely above the level before the pre-crisis level (Graph 3.4.1). Forecasts of a sustained productivity recovery have failed to materialise and — while there is no comprehensive explanation of this ‘productivity puzzle’ — the problem appears structural. Robust job creation (see Sections 1 and 3.3) has been concentrated in low-productivity sectors, especially services. Higher labour productivity growth would be needed to sustain higher living standards and wages (Haldane, 2018). High-productivity sectors have experienced relative decline. The finance and insurance sector was a disproportionate driver of productivity growth until 2008. 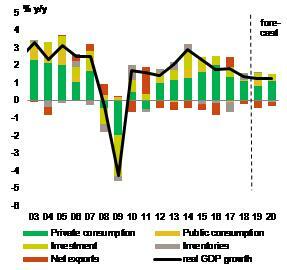 After the crisis, its contribution to GDP growth fell sharply. As Graph 3.4.2 shows, this was due both to lower labour productivity in finance and a 7.3 % fall in financial sector employment as a share of the total. Employment in the relatively highproductivity manufacturing sector fell by 39 % between 2007 and 2016, and manufacturing productivity growth was also subdued. Manufacturing now employs less than 10 % of the workforce, one of the lowest shares among industrialised economies. A detailed breakdown shows that telecommunications, finance, mining and quarrying, electricity and gas, pharmaceuticals and computer programming account for 60 % of the UK’s productivity shortfall (Riley et al., 2018). Source: Eurostat. 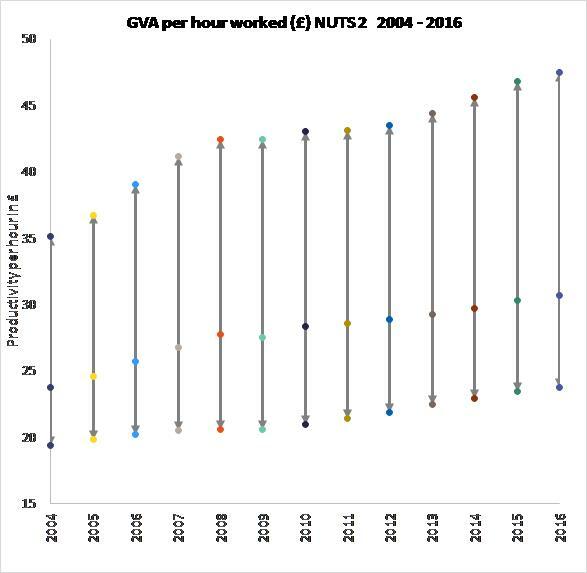 Note: the size of the circles is proportional to the share of GVA in 2018. Blue balloons indicate where productivity has decreased in this period. Gold balloons show sectors in which labour productivity has increased. 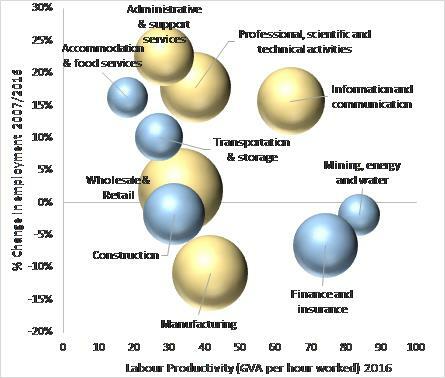 Services sectors with low productivity have absorbed more resources. Accommodation and food, and administration and support services now account for bigger proportions of total employment., while ‘…firms in the bottom 10% of the productivity distribution were predominantly in services industries; businesses in the distribution, hotels and restaurants industries…accounted for a third of all firms in this group in 2015’ (Ardanaz-Badia et al., 2017) ( 18 ). Differences in firm productivity growth are widening across and within sectors (Kierzenkowski et al., 2018a). 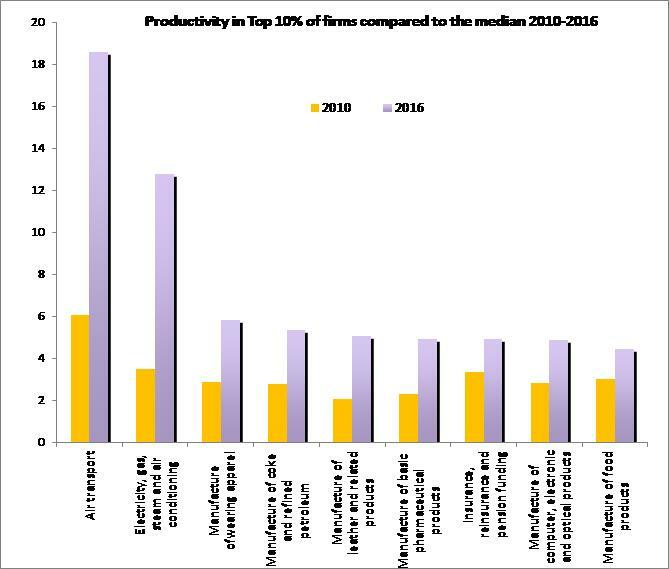 As Graph 3.4.3 shows, in the electricity and gas sector the ratio of the productivity of the top 10 % of firms relative to the median increased by a factor of four (from over 3 to over 12) between 2010 and 2016. The ratio tripled in air transport (from 6 to 18) over the same period. As discussed in Section 3.4.3, productivity levels and growth rates vary widely between regions and cities. Markets are competitive but management and technology diffusion are relatively weak. The ‘churn rate’ (i.e. the proportion of all firms entering and leaving markets) is higher than in the US, entry and exit barriers are low and markets remain competitive. Nevertheless, many loss-making firms remain in the market. Available international comparisons suggest higher management standards in the US and Germany than in the UK (Bloom & van Reenen, 2007) and this may be hampering UK productivity. There are also substantial differences in the quality of management across UK firms, with foreign-owned firms tending to benefit from better management practices. While the 2018 Innovation Scoreboard (European Commission, 2018e) presents the UK as a ‘leading innovator’, UK businesses have not capitalised on a strong science base, due to low R&D investment and a lack of institutional infrastructure to support innovation diffusion (see below). The Digital Transformation Index (European Commission, 2018f) points to below-average digital infrastructure and ‘entrepreneurial culture’ as barriers to the digitalisation of the UK economy and associated innovation. The high price and strict regulation of land can impair the allocation of resources in the broader economy. As discussed in Section 3.2 the UK land market is strictly regulated. In addition to driving a shortage of housing, this has contributed to driving up land values and commercial and residential property prices, especially in successful local economies. The price of land alone now accounts for more than half of total UK net worth (IPPR, 2018). This shifts savings and credit flows away from productive investment towards existing assets and land. The development of growth poles can be constrained and firms and workers are deterred from locating where they can be most productive. Expensive and tightly regulated land also hampers cost-effective and timely investment in infrastructure (see Section 3.4.2). In May 2018, the Chancellor launched a Business Productivity Review to establish the causes of and find solutions to the ‘productivity puzzle’. This review is part of the Industrial Strategy (HM Government, 2017) and “is focused on improving the productivity of businesses with lower productivity, sometimes described as a ‘long tail’, that lag behind the leading firms and underperform relative to domestic and international benchmarks” (BEIS, 2018a, p.4). The Industrial Strategy, which has a significant spatial dimension (see Section 3.4.3), is also aimed at concluding long-term sectoral deals with industry and addressing broad challenges such as artificial intelligence, ageing, clean growth and mobility. The ‘National Productivity Investment Fund’ (NPIF) is providing GBP 37 billion (EUR 42 billion) of capital funding between 2017-2018 and 2023-2024 for infrastructure linked to growth and productivity. The UK could establish a National Productivity Board, an objective, neutral and independent institution to investigate the productivity challenge and contribute to evidence-based policy making. The UK has not addressed the 2016 Council Recommendation (2016/C 349/01) and has decided not to establish a Productivity Board, considering it would bring limited value added. 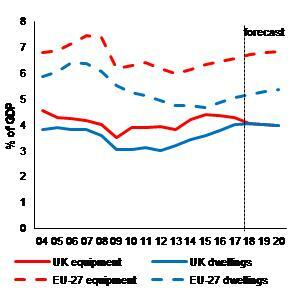 UK R&D investment intensity has been around 1.7 % of GDP for the past decade, below the EU average. In 2017, it rose to 1.69 % of GDP, still well below the EU and OECD averages (2.07 % and 2.4 % respectively). Private R&D intensity rose steadily from 1.02 % of GDP in 2012 to 1.13 % in 2017. This is partly thanks to public support through direct schemes managed by UK Research and Innovation and indirect schemes such as differentiated R&D tax incentives for SMEs and large companies. Together these were estimated to total more than 0.25 % of GDP in 2015. However, public R&D investment dropped from 0.57 % of GDP in 2013 to 0.51 % in 2017. As part of its Industrial Strategy (see above), the government aims to increase R&D investment intensity to 2.4 % of GDP by 2027. This would require public and private sector R&D investment to increase by around half. An additional GBP 1.6 billion (EUR 1.8 billion) of public R&D spending was announced in the 2018 Autumn Budget. Further plans on how to meet the targets are under development. R&D investment is concentrated in a limited number of companies and regions. Three quarters of all private R&D investment is concentrated in 400 companies (HM Government, 2017). South-East England and East England are responsible for 20 % and 17 %, respectively, of all R&D investment in the UK, with current R&D intensities (2.4 % and 3.4 %) at or above the proposed 2027 target. In contrast, Northern Ireland, Wales and North-East England each account for barely 2 % of UK R&D investment, with R&D intensity currently around 1 % of GDP in the latter two regions (ONS, 2018h & Eurostat, 2018). Despite an excellent research base, relatively weak science-business linkages hamper innovation diffusion. UK universities are regarded as global research powerhouses producing excellent scientific outputs ( 19 ). However, the business sector does not seem to be able to capitalise on this scientific strength. Science-business linkages are relatively weak, both in terms of scientific co-production ( 20 ) and business-funded public R&D ( 21 ). As a result, the UK scores poorly on knowledge diffusion in international rankings ( 22 ). There have been calls to strengthen the existing knowledge diffusion infrastructure (Haldane, 2018) ‘by creating some stronger and longer diffusion spoke’ to address the ‘long tail’ of companies suffering from low productivity growth (see above). Recent policy action to address these weaknesses includes the creation of UK Research and Innovation, bringing all support schemes for research and innovation under one umbrella, and the creation of the Industrial Strategy Challenge Fund. The UK could boost its low, stagnant productivity by addressing shortfalls in its investment in both physical capital and people. The UK has long been an outlier among advanced economies for its low investment rate. 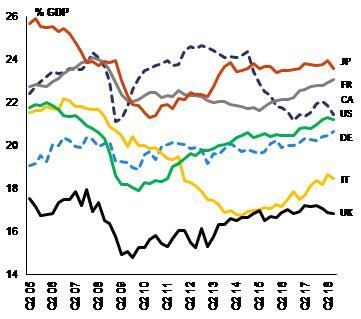 Over the last 20 years, the UK’s average ‘gross physical capital formation to GDP’ ratio of 16.7 % was the lowest (by almost 3 pps) among a group of over 30 advanced EU and non-EU economies. 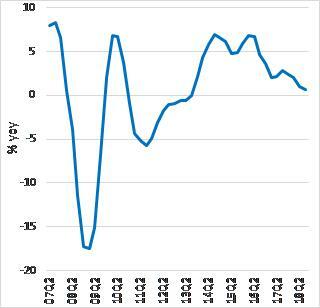 As Graph 3.4.4 shows, UK investment fell particularly sharply in the financial crisis. Shortfalls in both physical and human capital investment contribute to weak productivity. On the physical capital side, the UK has a broadbased challenge to deliver a higher level of investment in equipment, infrastructure (see below) and housing (see Section 3.2), and to bring down project costs. On the skills and human capital side, the challenge is as much to improve the effectiveness of systems in areas such as basic and technical skills as it is to increase funding (see Section 3.3). Box 3.4.1 summarises UK investment trends and sets out the principal barriers to higher investment. The post-crisis recovery in business investment has stalled. UK business investment recovered robustly until 2015. A cyclical recovery in other EU and global economies is ongoing, although it is projected to continue moderating into 2019 and 2020. In contrast, in a context of heightened uncertainty private investment growth has stalled in the UK. Business investment fell 3.7 % between Q42017 and Q42018, despite low unemployment and capacity pressures (see Sections 1 and 3.3). Although the UK has cut headline corporate tax rates, the wider tax system may create disincentives to investment (see Section 3.1). The UK’s low equipment investment (Graph 3.4.5) is only partly accounted for by the relatively small weight of capital-intensive production industries. In specific sectors, fixed investment by UK firms is relatively low. Weak equipment investment is also linked to evidence that the boost to net trade from the depreciation of sterling in 2016 is tailing off. While UK dwellings investment recovered earlier and more strongly than in the rest of the EU following the financial crisis, the UK house building sector has also lost momentum (see Section 3.2). Public capital expenditure is slightly below the EU average but rising. Total public sector net investment is projected to average 2.2 % of GDP over the next few years. In recent years, the government has increasingly focused such investment on network infrastructure, at the expense of education and healthcare facilities. As part of the 2019 Spending Review, it will set priorities for public investment for the following years, drawing on the National Infrastructure Assessment (see below). The government has made institutional reforms to tackle long-term infrastructure challenges. The UK has a significant challenge in the form of growing capacity pressures in road, rail and aviation networks, and the need for new and greener energy generation and supply capacity. Significant investment in infrastructure is also needed to meet rising demand for healthcare and support the transition to new care models. The government is increasing public infrastructure investment, which has historically been quite low. However, annual investment from the public and private sector needs to grow substantially over the next decade to deliver all the projects that are planned. The government has therefore set up two agencies to provide a more stable and long-term framework for infrastructure investment. The Infrastructure and Projects Authority (IPA), established in 2015, is in charge of monitoring projects and helping to deliver them. The National Infrastructure Commission (NIC) is an independent body established in 2016 to conduct long-term infrastructure planning, for the economy as a whole and for selected key projects. UK infrastructure has tended to be costly and slow to deliver. The UK is one of the leaders in Europe in aggregating purchasing power across public bodies and bundling contracts (McKinsey, 2018). Foreign firms are also relatively prominent in participating in, and winning, public construction tenders in the UK. Nevertheless, the UK has often struggled to deliver infrastructure in a timely and cost-effective way, with higher capital costs than elsewhere. The causes include short termism and fragmented, stop-start decision-making (NIC, 2018), and the structure of the UK construction industry (PWC, 2016). The government’s Transforming Infrastructure Performance programme sets out a 10-year plan to improve infrastructure productivity (IPA, 2017). In July 2018, the National Infrastructure Commission published a wide-ranging, long-term assessment of the UK’s infrastructure needs. The first National Infrastructure Assessment (NIC, 2018) sets out analysis and recommendations for infrastructure investment and management to 2050. The NIC was asked to work on the assumption that annual government spending on economic infrastructure would be 1.0-1.2 % of GDP between 2020 and 2050, which is broadly in line with current levels. The main themes of its recommendations include tackling urban congestion by prioritising devolved, stable long-term funding, improving the capacity of the UK's water supply and digital infrastructure, and reducing carbon emissions by leading moves to an energy system powered mainly by renewable energy sources such as solar and wind. The government gave an interim response to the NIC’s assessment alongside the 2018 Autumn Budget. It will publish a full response in 2019 in a National Infrastructure Strategy. Securing the amount of private funding required in the government’s projections will be a challenge. The November 2018 National Infrastructure and Construction Pipeline (IPA, 2018) set out over GBP 600 billion (EUR 680 billion) of public and private investment projects that are planned across the economy over the next decade. Around half of the value of the pipeline requires private funding, including in privatised utilities subject to economic regulation. In the 2018 Autumn Budget the government announced that in future it would not enter into any new Private Finance Initiative (PFI) contracts to deliver or maintain infrastructure and public services, having concluded that the model was inflexible and overly complex (HM Treasury, 2018). The European Investment Bank (EIB) has also had an important role in funding UK projects, particularly in infrastructure. The government has announced a review of its support for infrastructure finance, with a view to ensuring it meets market needs following Brexit. While transport investment has increased, the UK has to address a legacy of underinvestment. In its assessment of the UK’s future infrastructure needs (NIC, 2018), the NIC highlighted a range of problems with the quality and capacity of existing transport infrastructure, including high levels of congestion. These are linked to long-term underinvestment and negatively affect perceptions of road and rail infrastructure quality. According to the World Economic Forum’s Global Competitiveness Report (WEF, 2018), perceptions of UK road quality and overall road infrastructure are relatively poor. The UK is currently investing significantly in inter-urban transport links. The NIC (NIC, 2018) has recommended that investment should shift towards improving intraurban connectivity to relieve congestion and deliver greater benefits from agglomeration. There are significant issues with the reliability of rail services, reflected in low customer satisfaction. In the 2018 Market Performance Indicator (European Commission, 2018g), the UK scored 70.1 for train services, below the EU average of 76.8. In the Global Competitiveness Report (WEF, 2018) UK travellers also gave quite a low perception score for rail efficiency (60.1) and overall rail infrastructure (80.1). Ticket prices are also often high. A major overhaul of rail timetables across many operating companies in mid-2018 led to mass delays and cancellations in the north and south-east of England. The Office of Rail and Road’s investigation of the incident highlighted a range of failings (ORR, 2018). The east coast rail franchise was renationalised in May 2018 when its operator ran into financial difficulties. In response to these problems, the government has announced a large-scale review of how the privatised railway system operates. The opening of ‘Crossrail’, a new underground rail link linking east and west London and the surrounding area, has been delayed from December 2018 to 2020. The project had previously been progressing well, but now requires additional funding. Construction work has recently begun on the first phase of the ‘High Speed 2’ rail line between London and Birmingham. In the next Rail Control Period (CP6, 2019-2024) the government plans a greater focus on the renewal of ageing infrastructure within the GBP 48 billion (EUR 54 billion) total funding envelope. 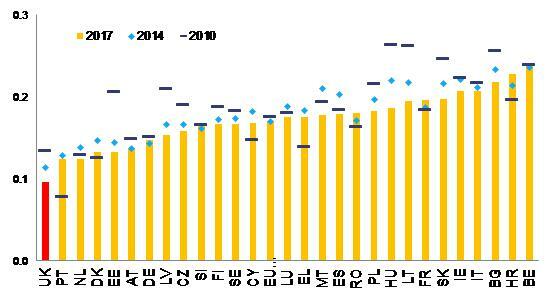 Road congestion levels are significantly above the EU average. The Commission (European Commission, 2018h) estimated that car users in the UK spent on average 45.2 hours in road congestion in 2017, which is among the highest figures in the EU. A National Roads Fund of GBP 28.8 billion (EUR 32.6 billion) from 2020-2025 will be funded by hypothecating English Vehicle Excise Duty to roads spending. Within this, the government’s second Roads Investment Strategy (RIS) sets out plans for GBP 25.3 billion (EUR 28.6 billion) of investment in the major roads network in 2020-2025. The National Roads Fund will also fund investment in a new major roads network and large local major road schemes. Pressure on local authority budgets has squeezed spending on the maintenance of local roads and degraded roads can exacerbate congestion. Central government has responded by increasing funding for local repairs by GBP 420 million (EUR 475 million) in 20182019. In June 2018, parliament approved the government’s Airports National Policy Statement, including a new north-west runway at Heathrow Airport. Heathrow’s plans now face substantial legal and environmental challenges, including a judicial review launched by London councils, the London mayor and non-governmental organisations. It currently plans to start extensive public consultations and engagement with stakeholder groups in spring 2019 as part of the preparation for its Development Consent Order application. Despite a well-functioning broadband market, challenges regarding deployment persist. The penetration of full-fibre services remains low, at 1.8 million (6 %) of premises (Ofcom, 2018). On 28 March 2018, the government set out the design of the broadband regulatory universal service obligation (USO) to be implemented by 2020. Everyone in the UK will have a legal right to an affordable connection of at least 10 Mbps from a designated provider, no matter where they live or work, up to a cost threshold of GBP 3 400 per premise (EUR 3 850) (enabling coverage of around 99.8 % of premises). On 23 July 2018, the Government published the Future Telecoms Infrastructure Review (DCMS, 2018). The review set out a long-term strategy to support the development of full-fibre networks and 5G. The government’s target – to have 15 million connections by 2025 with coverage of all parts of the country by 2033 – is consistent with the recommendation in the National Infrastructure Assessment (NIC, 2018) that the UK should aim for nationwide full-fibre broadband by 2033. The total investment required for the national rollout of full fibre is estimated at around GBP 30 billion (EUR 34 billion). However, full fibre will most likely require subsidy in some more remote areas. At the end of 2018, the Government launched a GBP 200 million (EUR 226 million) Rural Gigabit Connectivity scheme to test out approaches to full fibre rollout in rural areas from 2019-2020. 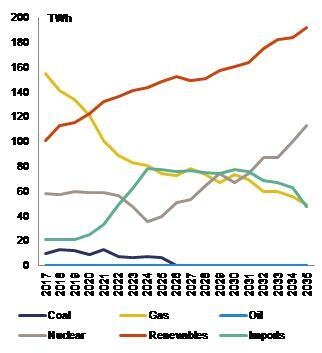 The UK needs to deliver significant new energy generation and supply capacity. The Contracts for Difference (CfD) scheme ( 23 ) is the key mechanism to incentivise investment in the UK’s electricity generation assets. The government is preparing for the third allocation round in 2019, the draft budget for which provides for an annual budget of GBP 60 million (EUR 68 million) for the delivery years 2023-2024 and 2024-2025, subject to a total capacity cap of 6 GW. The delivery of new nuclear generating capacity continues to be uncertain. As shown in Graph 3.4.6, the government envisages the construction of substantial new nuclear capacity over the next 15-20 years. Construction of two 1 630 MWe units at Hinkley Point C is proceeding and is on target for connection to the grid in 2025. However, no investment decisions have yet been taken on further nuclear capacity. Two international investors have abandoned plans for three large new-build projects — two of which are in northern England and one in Wales — and are closing or suspending their UK nuclear businesses. The government is examining new funding mechanisms including the regulated asset base model. It is also in discussion with a potential investor regarding state investment in a project alongside private capital. The NIC has recommended that the government support no more than one further nuclear power station before 2025, due to cost-effectiveness concerns (NIC, 2018). In June 2018, the government published a Nuclear Sector Deal (BEIS, 2018b). This paper sets a number of sectoral targets, including a 30 % reduction in the cost of new build projects by 2030 and savings of 20 % in the cost of decommissioning (compared with current estimates) by 2030. It also sets out a new framework to support the development and deployment of small modular reactors (SMRs). The UK currently has an interconnection level of about 6 % of installed electricity generating capacity. This is expected to increase to 8 % by 2020, still below the target of 10 %. The Great Britain market (i.e. England, Wales and Scotland) has low levels of interconnection with the rest of Europe. By contrast, the Northern Irish electricity market is fully integrated with the Republic of Ireland (see Ireland country report). New rules on the Integrated Single Electricity Market entered into force in October 2018. The NEMO link (BE-UK interconnector) was inaugurated in December 2018. A total of 12 further new interconnectors have been labelled ‘projects of common interest’ and are currently at various stages of planning or development. The government's projections for the future see interconnections playing an important role in maintaining energy security. The UK’s wholesale electricity market is relatively liquid due to its early efforts in energy market liberalisation. However, wholesale prices are above the EU average (EUR 51.74/MWh in 2017) (ACER, 2018) due to the generation mix and relatively low level of interconnection. At the same time, wholesale prices increased by only 5 % in 2017, much less than in neighbouring countries ( 24 ). Following a competitive procedure, a capacity market pays providers in return for a commitment to provide reliable sources of electricity to maintain system reliability when needed. In 2017, capacity costs were less than EUR 0.5/MWh (ACER, 2018). Technical problems have hampered the roll-out of smart meters, a pre-condition for engaging consumers in the market. To date, 13.5 million smart meters have been installed across Great Britain, of which 92 % are in households, against a government ambition of 50 million by 2020. The UK is on track to meet its Europe 2020 target for greenhouse gas emissions not covered by the EU Emissions Trading Scheme (ETS). According to approximated data, UK greenhouse gas emissions were 21 % lower in 2017 than in 2005. Projections based on existing measures indicate that emissions from non-ETS sectors will be 26 % below 2005 levels by 2020, overachieving the 16 % target under Europe 2020. However, without additional measures the UK may miss its 2030 target by 7 pps. The renewable energy share in the UK was 10.2 % in 2017, in line with the 2017-2018 indicative trajectory (10.2 %). Still, reaching the 2020 target (15 %) remains challenging, particularly as progress in the transport sector is lagging behind the planned trajectory under the national renewable energy action plan. The NIC has recommended that half of the UK’s power should come from renewables by 2030 (NIC, 2018). Final energy consumption in the UK slightly decreased in 2017, after increasing in 2016. This jeopardises the achievement of the national 2020 energy efficiency target unless the UK makes additional efforts. The UK’s National Energy and Climate Plan is to be adopted by 31 December 2019 in line with the Regulation on the Governance of the Energy Union and Climate Action (European Commission, 2018i). The plan will provide an overview of the UK’s investment needs until 2030 for the different dimensions of the Energy Union, including renewable energy, energy efficiency, security of supply, and climate mitigation and adaptation. The information provided, including in the draft plan submitted on 21 December 2018, will help with identifying and assessing the UK’s energy and climate-related investment needs. According to the draft plan, the government has allocated GBP 2.5 billion (EUR 2.8 billion) to investment in low-carbon innovation in 2015-2021 (BEIS, 2019). Further pledges have been made for investments in specific areas, such as improvements in the energy efficiency of buildings (around GBP 3.6 billion) (EUR 4.1 billion) and innovative low-carbon heat technologies (GBP 4.5 billion) (EUR 5.1 billion). Analysis for the Committee on Climate Change has suggested that the UK’s low-carbon economy could grow by around 11 % a year between 2015 and 2030. There has been no significant progress on poor urban air quality. The European Environment Agency has estimated that in 2015 more than 40 000 premature deaths in the UK were attributable to concentrations of fine particulate matter, nitrogen dioxide (NO2) and ozone (EEA, 2018). This corresponds to over 400 000 life-years lost due to air pollution in total, or more than 600 life-years per 100 000 inhabitants. In 2016, NO2 levels exceeded EU standards in 37 air quality zones, although in 36 of these the latest emissions data show slight improvements. The persistent breaches of NO2 air quality requirements are subject of a European Commission infringement procedure. There are particularly large regional differences in living standards in the UK. The coefficient per capita GDP variation was 67 % in 2016, more than double the EU average (29.7 %). The gap between the best performing region and the average is higher than in any other Member State. GDP per capita in Wales is only 41 % of the Greater London level. This is driven mainly by stark inter-regional differences in productivity (Gal & Egeland, 2018). The productivity of an average firm in London is double that of one in the North East. The concentration of finance and other knowledge-intensive sectors is reflected in higher productivity in London and other big cities. However, the productivity distribution of individual firms actually has a greater influence on differences in average productivity than the sector mix (ONS, 2018h). Regional productivity differentials are also growing wider. Differences in productivity between the leading and the less advanced regions are increasing year by year. Productivity dispersion is increasing and the less productive regions are not catching up (Graph 3.4.7). In 2010-2016, the coefficient of per capita GDP variation grew by 22 %, one of the highest increases in the EU. If productivity in less productive regions does not catch up, income inequality will tend to increase over time (Bachtler, 2017). Agglomeration effects play a relatively minor role outside London. While there are agglomeration effects in Northern England and the Midlands, their impact is limited despite the presence of big cities such as Birmingham, Manchester and Leeds (Ahrend et al., 2017). Clusters and the relative proximity of production centres also seem to have little impact on firms’ performance (Harris et al., 2018). Shortcomings in the quality and capacity of transport networks (see Section 3.4.2) and a lack of sufficient and affordable housing in the right places (see Section 3.2.2) limit workers’ choices and the development of positive agglomeration effects. Four variables seem to explain most of the variation in productivity performance across regions (European Commission, 2017b). These are innovation, market size, higher education and life-long learning, and infrastructure. Disparities in innovation performance across regions are linked to disparities in R&D investment (see Section 3.4.1). ‘Sales of new-to-the-market or new-to-the-firm innovations’ and ‘business expenditure in R&D’ are subject to the maximum dispersion across UK regions according to the 2017 Regional Innovation Scoreboard. Good transport and digital infrastructure can mitigate some of the difficulties resulting from limited market size and agglomeration economies, but the UK has shortcomings in both areas (see Section 3.4.2). The deficit of digital infrastructure may be acting as a barrier to the diffusion of new technologies and development of new business models in some regions. The Industrial Strategy (see Section 3.4.1) has a significant regional and local dimension. There is a lively debate as to whether the UK’s centralised governance limits lagging regions’ capacity to take effective action to address productivity disparities. For example, the methodology used to select and prioritise infrastructure projects has been accused of contributing to the concentration of infrastructure investment around London (Coyle & Sensier, 2018). The Industrial Strategy focuses on regional projects such as the “Northern Powerhouse” and “Midlands Engine”. Local industrial strategies, which aim to create alliances to develop local development potential, are the latest step in the more decentralised approach initiated in 2010 with City Deals, Devolution Deals and Local Enterprise Partnerships. Total physical investment in the UK fell significantly during the crisis, with a sharp fall in private investment only partially offset by a temporary increase in public investment. Public investment is marginally below the EU average and there are shortcomings in transport infrastructure (see Section 3.4). Private investment is significantly below the EU average, despite a recovery from a post-crisis trough. Equipment investment is particularly low. Relatively low housebuilding has contributed to the UK’s housing shortage (see Section 3.2). Heightened uncertainty is weighing on investment (see Section 1). Overall barriers to private investment in the UK are moderate, as confirmed by the European Commission’s assessment. Relevant reforms have been adopted on spatial planning and technical skills, but effective implementation is challenging and structural problems remain. 1. Spatial planning regulations: Regulation of the land market, particularly of residential construction, is strict and complex (see Section 3.2). The process of obtaining planning permission is often lengthy, complex, uncertain and costly. Limits on the scope for development, particularly around poles of economic growth, have led to an undersupply of housing and very high prices for non-agricultural land. The land prices and complex planning system contribute to the tendency for infrastructure projects to take longer and cost more than in other European countries (see Section 3.4). Planning restrictions can also hinder the use of modern, efficient commercial buildings and equipment. Substantial ongoing reforms to the planning system should help to facilitate increased development, but may not prove sufficient. 2. Technical skills: While the UK has a strong higher education system, there are weaknesses in both technical and basic skills (see Section 3.3) which contribute to its weak productivity. Skills shortages are often most acute in occupations linked closely to capital investment, such as engineering and tradespeople. The UK is implementing a reform of vocational training to introduce classroom-based ‘T-level’ qualifications and work-based apprenticeships. A total of 15 T-level qualifications are to be developed with the first three (education and childcare, construction and digital) available in 2020. Registration numbers for this new twin-track system are plunging and, although an apprenticeship levy has been introduced to help employers, uptake remains low and some employers find the application procedures confusing. The government-owned British Business Bank seeks to improve finance markets for smaller businesses, including through loans and mentoring for entrepreneurs, and loan guarantees for SME house builders. Ensure that the nominal growth rate of net primary government expenditure does not exceed 1.6 % in 2019-2020, corresponding to an annual structural adjustment of 0.6 % of GDP. CSRs related to compliance with the Stability and Growth Pact will be assessed in spring once the final data is available. Boost housing supply, particularly in areas of highest demand, including through additional reforms to the planning system. Annual net housing supply has increased significantly from post-crisis lows. However, since mid-2017, the recovery in house building has lost momentum, and it is now stabilising at a level below what would be necessary to meet estimated demand. Real house prices are stabilising, and real rents are now falling slightly, but the cost of housing remains high. The government has recently extended and revised a number of existing housing policies, including updating spatial planning rules. The rules on local authority borrowing to build public housing have been relaxed, but wholly new initiatives have otherwise been limited. CSR 3: Address skills and progression needs by setting targets for the quality and the effectiveness of apprenticeships and by investing more in upskilling those already in the labour force. The government has introduced a series of initiatives that seek to invest in the skills levels of the workforce thus helping advance career progression. The National Retraining Scheme, which seeks to provide career guidance and advice in line with job experience, has been launched. The newly established tripartite National Retraining Partnership comprising the Government, Employers and the Trade Unions will deliver job specific training, in order to meet labour demand needs and increase productivity whilst reducing skills mismatches. The on-going reform of the Vocational Training system plans to introduce 15 ‘T-level’ qualifications, but only three will be available by 2020. Registration numbers for this new twin-track system are far lower than expected and although an apprenticeship levy has been introduced to provide funding to employers, uptake remains low. 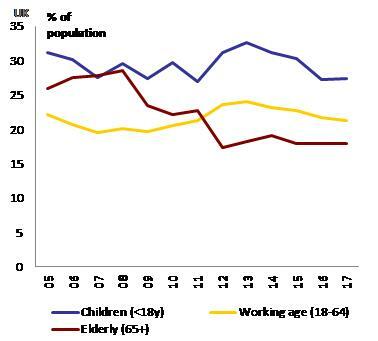 78.2 % of the population aged 20-64 was employed in 2017. R&D intensity rose marginally to 1.69 % in 2017. Public R&D intensity was 0.51 % and business R&D intensity 1.13 %. The UK is below the EU average of 2.07 % for R&D intensity. EU average public R&D intensity was 0.69 % and business R&D intensity 1.36 %. According to the latest national projections and taking into account existing measures, the target is expected to be achieved: -26 % in 2020 compared to 2005 (with a margin of 10 percentage points). According to preliminary estimates, the change in non-ETS greenhouse gas emissions between 2005 and 2017 was -21 %, therefore the target is expected to be achieved. At a level of 10.21 % in 2017, the UK is still some distance away from its 2020 target of 15 %, even though it is in line with its indicative national trajectory. With a 5.05 % share of renewable energy sources in transport in 2017, the UK is almost halfway towards the binding 10 % target in transport to be achieved by 2020. The UK’s slow uptake of renewables in the transport sector has been driven by the restriction in the use of biofuels with high indirect land-use change implications. 129.2 million tonnes of oil equivalent (Mtoe) for final energy consumption corresponding to 177.6 Mtoe for primary energy consumption. The UK has already met its 2020 primary energy consumption target but remains 3.2 % above its 2020 final energy consumption target. The UK has to increase its effort to cut final energy consumption by the required levels. The rate of early school leavers declined by 2.8 pps. between 2012 and 2017, from 13.4 % to 10.6 %, which is on par with the EU average. The tertiary attainment rate of 30-34 year olds reached 48.3 % in 2017, a small increase on the 2016 rate of 48.2 %. This is significantly above the EU average of 39.9 %. The ‘at risk of poverty or social exclusion rate’ stood at 22 % in 2017, a small decrease from the 2016 figure of 22.2 %. (1) Latest data Q3 2018. Includes not only banks but all monetary financial institutions excluding central banks. (2) Latest data Q2 2018. (3) Quarterly values are annualised. Source: European Commission (long-term interest rates); World Bank (gross external debt); Eurostat (private debt); ECB (all other indicators). (1) People at risk of poverty or social exclusion (AROPE): individuals who are at risk of poverty (AROP) and/or suffering from severe material deprivation (SMD) and/or living in households with zero or very low work intensity (LWI). (2) Unemployed persons are all those who were not employed but had actively sought work and were ready to begin working immediately or within two weeks. (3) Long-term unemployed are people who have been unemployed for at least 12 months. (4) Gross disposable household income is defined in unadjusted terms, according to the draft Joint Employment Report 2019. (5) Reduction in percentage of the risk of poverty rate, due to social transfers (calculated comparing at-risk-of poverty rates before social transfers with those after transfers; pensions are not considered as social transfers in the calculation). (6) Average of first three quarters of 2018 for the employment rate, long-term unemployment rate and gender employment gap. Data for unemployment rate is annual (except for DK, EE, EL, HU, IT and UK data based on first three quarters of 2018). (1) Difference between the average gross hourly earnings of male paid employees and of female paid employees as a percentage of average gross hourly earnings of male paid employees. It is defined as "unadjusted", as it does not correct for the distribution of individual characteristics (and thus gives an overall picture of gender inequalities in terms of pay). All employees working in firms with ten or more employees, without restrictions for age and hours worked, are included. (2) PISA (OECD) results for low achievement in mathematics for 15 year-olds. (3) Impact of socio-economic and cultural status on PISA (OECD) scores. Values for 2012 and 2015 refer respectively to mathematics and science. (4) Average of first three quarters of 2018 for the activity rate, employment growth, employment rate, part-time employment, fixed-term employment. Data for youth unemployment rate is annual (except for DK, EE, EL, HU, IT and UK data based on first three quarters of 2018). (1) Value added in constant prices divided by the number of persons employed. (2) Compensation of employees in current prices divided by value added in constant prices. (3) The methodologies, including the assumptions, for this indicator are shown in detail here: http://www.doingbusiness.org/methodology. (4) Average of the answer to question Q7B_a. "[Bank loan]: If you applied and tried to negotiate for this type of financing over the past six months, what was the outcome?". Answers were codified as follows: zero if received everything, one if received 75% and above, two if received below 75%, three if refused or rejected and treated as missing values if the application is still pending or don't know. (5) Percentage population aged 15-64 having completed tertiary education. (6) Percentage population aged 20-24 having attained at least upper secondary education. (8) Aggregate OECD indicators of regulation in energy, transport and communications (ETCR). Sources: European Commission; World Bank — Doing Business (for enforcing contracts and time to start a business); OECD (for the product market regulation indicators); SAFE (for outcome of SMEs' applications for bank loans). Electricity and gas prices for medium-sized industrial users: consumption band 500–20 00MWh and 10 000–100 000 GJ; figures excl. VAT. Aggregated supplier concentration index: Herfindahl-Hirschman index for net imports of crude oil and NGL, natural gas and hard coal. Smaller values indicate larger diversification and hence lower risk. Arpaia, A. and A. 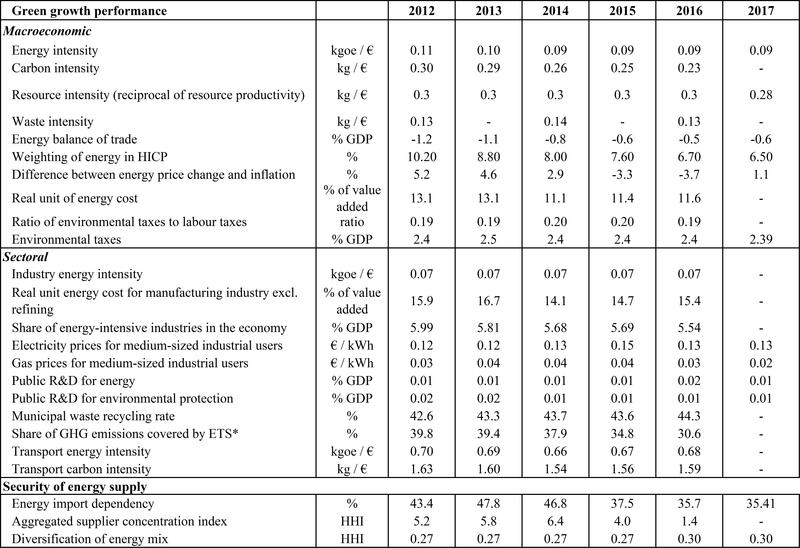 Kiss (2015), Benchmarks for the assessment of wage developments: Spring 2015, Analytical web note 2/2015, European Commission. Bell, D.N.F. and D. G. Blanchflower (2018), The lack of wage growth and the falling NAIRU, NBER Working Paper No. 24502, April. European Commission (2018a), Labour Markets and Wage Developments Report, 2018. HM Treasury (2018), Autumn Budget, Crown. OBR — Office for Budget Responsibility (2018a), Economic and Fiscal Outlook – October 2018. Shelter (2018): Homelessness in Great Britain – the numbers behind the story. CASE — Center for Social and Economic Research (2018), Study and Reports on the VAT Gap in the EU-28 Member States: 2018 Final Report, Report for DG TAXUD, European Commission. European Commission (2018b), Taxation Trends in the European Union – 2018 Edition. European Commission (2018c), Aggressive tax planning indicators – Final Report, Taxation Papers Working Paper No 71 –2017. HMRC — HM Revenue & Customs (2018a), Corporation Tax Statistics 2018. HMRC — HM Revenue & Customs (2018b), Estimated Costs of Tax Reliefs. IFS — Institute for Fiscal Studies & The Health Foundation (2018), Securing the future: funding health and social care to the 2030s. 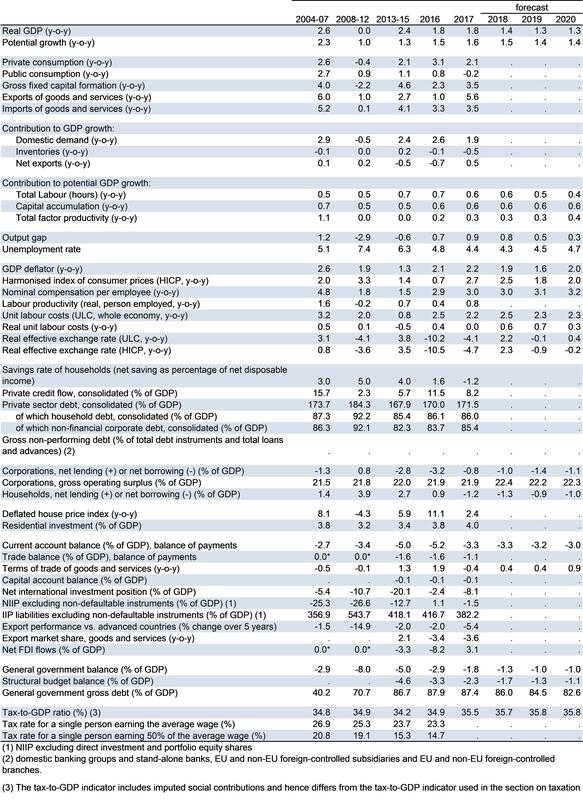 IMF — International Monetary Fund (2018), Fiscal Monitor, October 2018: Managing Public Wealth. OBR — Office for Budget Responsibility (2018b), Fiscal Sustainability Report – July 2018. ZEW — Zentrum für Europäische Wirtschaftsforschung (2017), Effective tax levels using the Devereux/Griffith Methodology – Final Report, Project for the European Commission. Bentley, D, (2017), The land question: Fixing the dysfunction at the root of the housing crisis. BoE — Bank of England (2018), Financial Stability Report November 2018 - Stress testing the UK banking system: 2018 results, 28 November. DCLG — Department for Communities and Local Government (2017), Fixing our broken housing market, Crown. EBA — European Banking Authority (2018), 2018 EU-wide stress test results, 2 November. HM Government (2018), Independent Review of Build Out: Final Report, Crown. IFS — Institute for Fiscal Studies (2018a), The decline of homeownership among young adults, IFS Briefing note BN224, February. MHCLG — Ministry of Housing, Communities & Local Government (2018a), Housing Supply: Net additional dwellings, England: 2017-18, statistical release, 15 November. MHCLG — Ministry of Housing, Communities & Local Government (2018b), Planning Applications in England: July to September 2018, statistical release, 13 December. MHCLG — Ministry of Housing, Communities & Local Government (2018c), Planning Reform: Supporting the high street and increasing the delivery of new homes, consultation document, October. ONS — Office for National Statistics (2018a), UK House Price Index: November 2018. ONS — Office for National Statistics (2018b), Index of Private Housing Rental Prices, UK: December 2018. ONS — Office for National Statistics (2018c), Housing affordability in England and Wales: 2017, 26 April 2018. ONS — Office for National Statistics (2018d), First-time buyer housing affordability in England and Wales: 2017, 25 July 2018. ONS — Office for National Statistics (2018e), Household projections in England: 2016-based, 20 September 2018. ONS — Office for National Statistics (2018f), Construction statistics: Number 19, 2018 edition, 22 August. Resolution Foundation (2018), House of the rising son (or daughter): The impact of parental wealth on their children’s homeownership, December. Resolution Foundation (2017), Home Affront: housing across the generations, 20 September 2017. RICS — Royal Institute of Chartered Surveyors (2018), UK Residential Market Survey: December 2018. UK Finance (2018a), UK Finance: Mortgage Trends Update: August 2018. UK Finance (2018b), UK Finance: Mortgage Arrears and Possessions Update Quarter 3 2018. Canton, E., Thum-Thysen, A. and P. Voigt (2018), Economists’ musings on human capital investment: How efficient is public spending on education in EU Member States?, ECFIN Discussion Paper. CIPD — Chartered Institute of Personnel Development (2018), Assessing the early impact of the apprenticeship levy – employers’ perspective, Research Report, January. CLASS — Centre for Labour and Social Studies (2018), Labour Market Realities 2018, Workers on the Brink. DoH — Department of Health and Social Care (2018), The Government response to the Health and Social Care Select Committee Second Report of Session 2017-19, ‘The Nursing Workforce’. DWP — Department for Work and Pensions & DoH — Department of Health (2017), Improving Lives The Future of Work, Health and Disability, December. EHRC — Equality and Human Rights Commission (2018), The Cumulative Impact of Tax and Welfare Reforms, March. European Commission (2018d), Business and consumer surveys. European Commission (2018e). Employment and Social Developments in Europe Annual Review 2018. Family and Childcare Trust (2018), Childcare survey 2018. Glendinning, C. (2018), ESPN Thematic Report on Challenges in long-term Care: United Kingdom. House of Commons (2018a), Retaining and developing the teaching workforce. House of Commons, Public Accounts Select Committee. House of Commons (2018b), Poverty in the UK: statistics, Briefing Paper 7096, August. House of Commons (2018c), Universal Support, Work and Pensions Committee, October. House of Commons (2018d), Childcare: 30 hours of free childcare – eligibility, access codes and charges (England), Briefing Paper 8051, January. IFS — Institute for Fiscal Studies (2018b), Switching millions to universal credit poses real threat of ‘poll tax’ moment, October. IFS — Institute for Fiscal Studies (2017), Living standards, poverty and inequality in the UK: 2017-18 to 2021-22, November 2. NAO — National Audit Office (2018a), Sustainability and transformation in the NHS. NAO — National Audit Office (2018b), Developing new care models through NHS vanguards. NAO — National Audit Office (2018c), The health and social care interface. NAO — National Audit Office (2017), The higher education market. NHS England (2018), Delayed Transfers of Care Statistics for England 2017/18. NMC — Nursing & Midwifery Council (2018), The NMC register. OECD/EU (2018), Health at a Glance: Europe 2018: State of Health in the EU Cycle, OECD Publishing, Paris. ONS — Office for National Statistics (2018g), Wealth in Great Britain Wave 5: 2014 to 2016, 1 February. Public Health England (2017), Facing the Facts, Shaping the Future. A draft health and care workforce strategy for England to 2027. Sibieta, L. (2018), The teacher labour market in England: shortages, subject expertise and incentives, Education Policy Institute, August. Skinner, C. (2016), Early education & child care, in J. Bradshaw (ed.) The Wellbeing of Children in the UK, Bristol: The Policy Press. SMC - Social Metrics Commission (2018), A new measure of poverty for the UK. Taylor, M. (2017), Good work: the Taylor review of modern working practices, July. Thorley, C. (2017). Not by degrees: Improving student mental health in the UK's universities. Institute for Public Policy Research. TUC — Trades Union Congress (2017), The Gig is Up, June. Universities Scotland (2017), Working to widen access, November. Universities UK (2018), Patterns and trends in UK higher education 2018, September. Welsh Government (2016), Taking Wales Forward: 2016-2021. ACER (2018), Annual Report on the Results of Monitoring the Internal Electricity and Natural Gas Markets in 2017 — Electricity Wholesale Markets Volume, October 2018. Ahrend, R., Farchy, E., Kaplanis, I., and A. Lembcke (2017), What Makes Cities More Productive? Agglomeration economies and the role of urban governance: Evidence from 5 OECD Countries, OECD Productivity Working Papers, 2017-02, February. Ardanaz-Badia, A., Gaganan, A, and P. Wales (2017), Understanding firms in the bottom 10 % of the labour productivity distribution in Great Britain: “the laggards”, 2003 to 2015, Office for National Statistics, July. Bachtler, J., Martins J.O., Wostner P. and P. Zuber (2017), Towards Cohesion Policy 4.0: Structural Transformation and Inclusive Growth, Regional Studies Association Brussels, June. BEIS — Department for Business, Energy and Industrial Strategy (2019), The UK’s draft integrated National Climate and Energy Plan (NECP), January. BEIS — Department for Business, Energy and Industrial Strategy (2018a), Business Productivity Review — Government Call for Evidence, May. BEIS — Department for Business, Energy and Industrial Strategy (2018b), Nuclear Sector Deal, June. Bloom N. and J. van Reenen (2007), Why Do Management Practices Differ Across Firms and Countries?, Journal of Economic Perspectives, vol. 24 No.1, pp.203-244. Coyle, D. and M. Sensier (2018), The Imperial Treasury: Appraisal Methodology and Regional Economic Performance in the UK, Bennet Institute for Public Policy working paper No. 02/2018, University of Cambridge, July. DCMS — Department for Digital, Culture, Media & Sport (2018), Future telecoms infrastructure review. EEA — European Environment Agency (2018), Air quality in Europe — 2018 report, October. European Commission (2018f), European Innovation Scoreboard 2018. European Commission (2017b), Regional Innovation Scoreboard 2017. European Commission (2018g), Digital Transformation Scoreboard 2018 – EU businesses go digital: Opportunities, Outcomes and Uptake. European Commission (2018i), Joint Research centre calculations based on TomTom data. European Commission (2018j), Regulation (EU) 2018/1999 of the European Parliament and of the Council of 11 December 2018 on the Governance of the Energy Union and Climate Action, amending Regulations (EC) No 663/2009 and (EC) No 715/2009 of the European Parliament and of the Council, Directives 94/22/EC, 98/70/EC, 2009/31/EC, 2009/73/EC, 2010/31/EU, 2012/27/EU and 2013/30/EU of the European Parliament and of the Council, Council Directives 2009/119/EC and (EU) 2015/652 and repealing Regulation (EU) No 525/2013 of the European Parliament and of the Council (Text with EEA relevance). Eurostat (2018), R&D expenditure at regional level. Gal, P. and J. Egeland (2018), Reducing regional disparities in productivity in the United Kingdom, OECD Economics Department Working Papers No 1456 OECD Publishing Paris. Haldane, A. (2018), The UK’s Productivity Problem: Hub No Spokes, Speech to the Academy of Social Sciences Annual Lecture by the Bank of England’s Chief Economist, 28 June 2018. Harris, R., Moffat J., Sunley P., Martin R., Evenhuis E. and A. Pike (2018), Impact of Clustering on Manufacturing Total Factor Productivity (TFP), Great Britain (1984-2014), July. HM Government (2017), Industrial Strategy White Paper — Building a Britain fit for the Future, Crown. IPA — Infrastructure and Projects Authority (2018), 2018 National Infrastructure and Construction Pipeline, 26 November. IPA — Infrastructure and Projects Authority (2017), Transforming Infrastructure Performance. IPPR — Institute for Public Policy Research (2018), The invisible land: The hidden force driving the UK's unequal economy and the broken housing market, August 2018. Kierzenkowski R., Gal, P., Fulop, G., Flaig, D. and F. van Tongeren (2018a), The UK Productivity Puzzle Through the Magnifying Glass: A Sectoral Perspective, Economic Department Working Papers No. 1491, August. Mason, G., O’Mahony, M. and R. Riley (2018), What is holding back UK productivity? Lessons from decades of measurement, National Institute Economic Review No. 246 November 2018. McKinsey (2018), Building across borders: The state of internationalisation in European public construction tenders, Capital Projects & Infrastructure, October. NIC — National Infrastructure Commission (2018), National Infrastructure Assessment, July 2018. OECD (2018), Productivity and Jobs in a Globalised World: (How) Can All Regions Benefit?, OECD Publishing, Paris. Ofcom (2018), Connected Nations 2018, December. ONS — Office for National Statistics (2017), An international comparison of gross fixed capital formation: November 2017. ONS — Office for National Statistics (2018h), Regional firm-level productivity analysis for the non-financial business economy, Great Britain: April 2018, April. ORR — Office of Rail and Road (2018), Independent inquiry into the timetable disruption in May 2018: Final report, 7 December. PWC (2016), High speed rail international benchmarking study, HS Phase Two, November. Riley, R., Rincon-Aznar, A. and L. Samek (2018), Below the Aggregate: A Sectoral Account of the UK Productivity Puzzle, ESCoE Discussion Paper 2018-06, May. World Bank (2019), Doing Business 2019: Training for reform. WEF — World Economic Forum (2018), The Global Competiveness Report 2018, 16 October. (1) () This report assesses the UK’s economy in light of the European Commission’s Annual Growth Survey published on 21 November 2018. In the survey, the Commission calls on EU Member States to implement reforms to make the European economy more productive, resilient and inclusive. In so doing, Member States should focus their efforts on the three elements of the virtuous triangle of economic policy — boosting investment, pursuing structural reforms and ensuring responsible fiscal policies. (2) () Information on the level of progress and actions taken to address the policy advice in each respective subpart of a country-specific recommendation is presented in the overview table in the Annex. (3) () This removes imputed transactions resulting in a measure of gross saving that reflects household saving (excluding pension contributions) in the respective quarter or year. (4) () This is a benchmark for wage growth consistent with internal labour market conditions. It is wage growth predicted on the basis of changes in labour productivity, prices and the unemployment rate (see Arpaia and Kiss, 2015). (5) () S80/S20 income quintile share ratio. (6) () Information on the level of progress and actions taken to address the policy advice in each respective subpart of a CSR is presented in the overview table in Annex A. This overall assessment does not include an assessment of compliance with the Stability and Growth Pact. (7) () The tax wedge shows the proportional difference between the costs of a worker to their employer and the employee’s net earnings. Data are taken from the European Commission Tax and Benefit Indicator database. (8) () In 2016, dividend income received by the UK was EUR 58 billion (GBP 51 billion) and dividend income paid by the UK was EUR 50 billion (GBP 44 billion) (Source: Eurostat). (9) () ATAD — Anti-Tax Avoidance Directive: Council Directive 2016/1164 of 12 July 2016. (10) () Rules designed to prevent that businesses lower or avoid taxation due to tax classification differences in a cross-border context. (11) () Including the ratification of the Multilateral Convention to Implement Tax Treaty Related Measures to Prevent Base Erosion and Profit Shifting (MLI). (12) () The zero rate applies to a broad range of goods and services including many foodstuffs, books, pharmaceutical products, water supply, passenger transport and the construction of new dwellings. The 5 % rate applies, inter alia to domestic fuel and power, energy-saving materials and certain residential renovations. (13) () The National Living Wage is an obligatory minimum wage payable to workers in the UK. As of April 2018, it is GBP 7.83 per hour for those aged 25 and over, GBP 7.38 for those aged 21–24, GBP 5.90 for ages 18–20, GBP 4.20 for under 18s and GBP 3.70 for apprentices. (14) () The North of England includes the North East, North West, and Yorkshire and Humber. (15) () At 14.1 pps.in 2016, the gap in early school leaving between those with and without disabilities is wider than the EU average of 12.6 pps. (16) () The adequacy of minimum income benefits in the UK exceeds the EU average, according to SPC Committee’s Benchmarking Framework on Minimum Incomes. For details, see the draft Joint Employment Report 2019 (COM(2018) 761 final). (17) () People sleeping, about to bed down (sitting on/in or standing next to their bedding) or actually bedded down in the open air (such as on the streets, in tents, doorways, parks, bus shelters or encampments). People in buildings or other places not designed for habitation (such as stairwells, barns, sheds, car parks, cars, derelict boats, stations, or ‘bashes’). (18) () Productivity measurements in services should be treated with caution (see Mason et al., 2018). The OECD estimate that the UK-US productivity gap has previously been overestimated by 8 pps (OECD, 2018). (19) () In 2015, 15.3 % of UK scientific publications ranked among the top 10 % most cited publications worldwide. (20) () The UK ranks 10th in the EU in terms of the number of public-private co-publications as a percentage of total publications. (21) () Public expenditure on business-funded R&D was 0.021 % of GDP in 2015, less than half the EU average. (22) () According to the Global Innovation Index by Cornell University, INSEAD and WIPO, the UK ranks only 38th globally in terms of knowledge diffusion. (23) () CfD is a scheme to provide renewable energy providers with income guarantees. If an agreed ‘strike price’ is higher than the market price, the government-owned Low-Carbon Contracts Company must pay the renewable generator the difference between the two prices. If the opposite is true, the renewable generator must pay back the difference. (24) () 22 % in France and the Netherlands and 16 % in the allIrish market. (25) () The following categories are used to assess progress in implementing the 2018 country-specific recommendations (CSRs):No progress: The Member State has not credibly announced nor adopted any measures to address the CSR. This category covers a number of typical situations, to be interpreted on a case-by-case basis taking into account country-specific conditions. They include the following:no legal, administrative, or budgetary measures have been announced;in the national reform programme;in any other official communication to the national Parliament/relevant parliamentary committees or the European Commission; publicly (e.g. in a press statement or on the government's website); no non-legislative acts have been presented by the governing or legislative body; the Member State has taken initial steps in addressing the CSR, such as commissioning a study or setting up a study group to analyse possible measures to be taken (unless the CSR explicitly asks for orientations or exploratory actions). However, it has not proposed any clearly-specified measure(s) to address the CSR.Limited progress: The Member State has:announced certain measures but these address the CSR only to a limited extent; and/orpresented legislative acts in the governing or legislative body but these have not been adopted yet and substantial further, non-legislative work is needed before the CSR is implemented; presented non-legislative acts, but has not followed these up with the implementation needed to address the CSR.Some progress: The Member State has adopted measures that partly address the CSR; and/or that address the CSR, but a fair amount of work is still needed to address the CSR fully as only a few of the measures have been implemented. For instance, a measure or measures have been adopted by the national Parliament or by ministerial decision, but no implementing decisions are in place.Substantial progress: The Member State has adopted measures that go a long way towards addressing the CSR and most of them have been implemented.Full implementation: The Member State has implemented all measures needed to address the CSR appropriately. (I) ()Public investment is defined as gross fixed capital formation + investment grants + national expenditure on agriculture and fisheries. (II) ()The European Pillar of Social Rights was proclaimed on 17 November 2017 by the European Parliament, the Council and the European Commission.